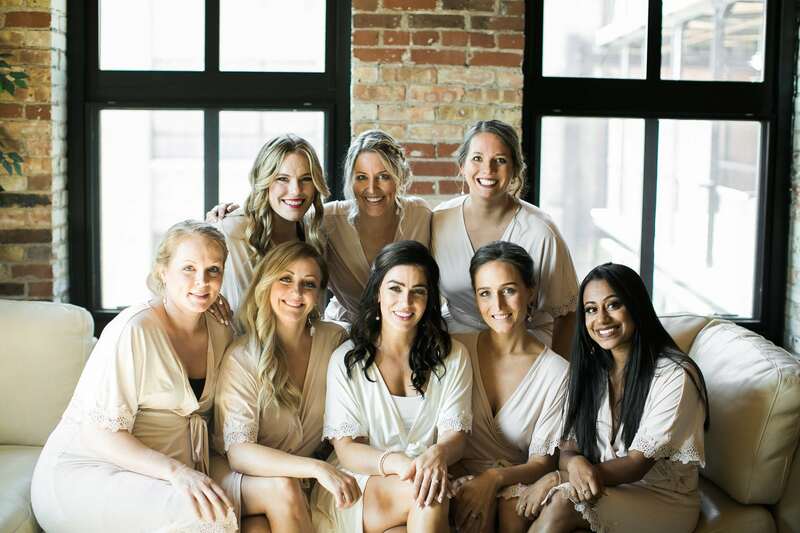 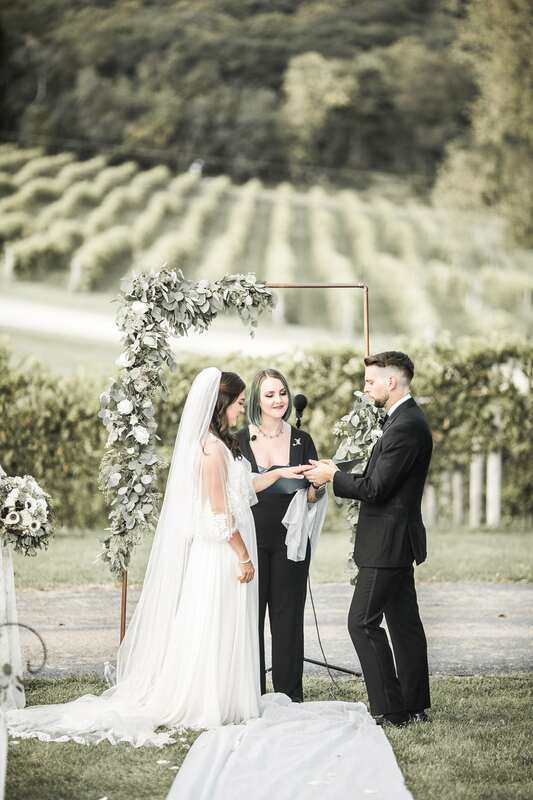 We were thrilled to coordinate this wedding, as we were referred by a previous client who happened to be one of Chelsea’s bridesmaids. 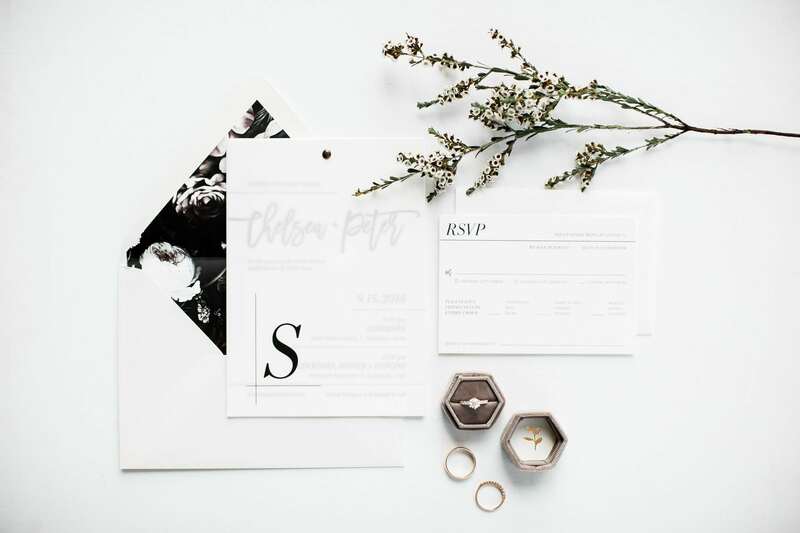 We love client referrals! 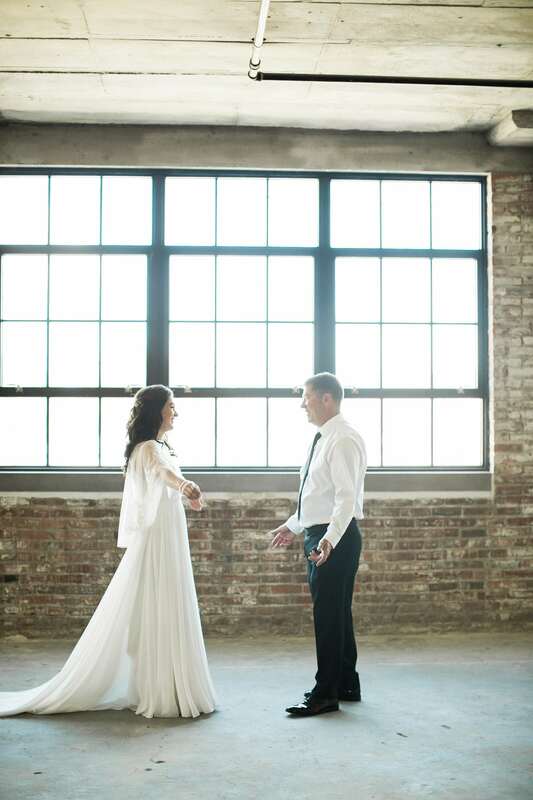 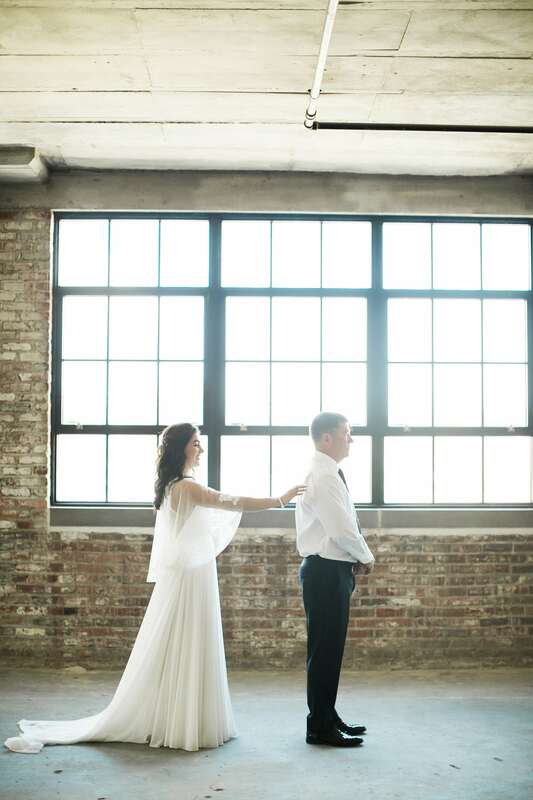 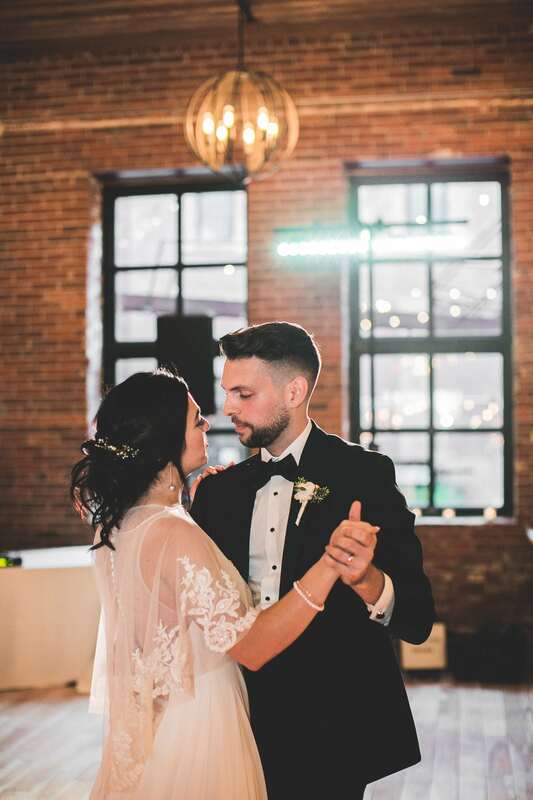 While the couple currently lives in Chicago, they had a vision for a ‘hometown’ wedding in Dubuque. 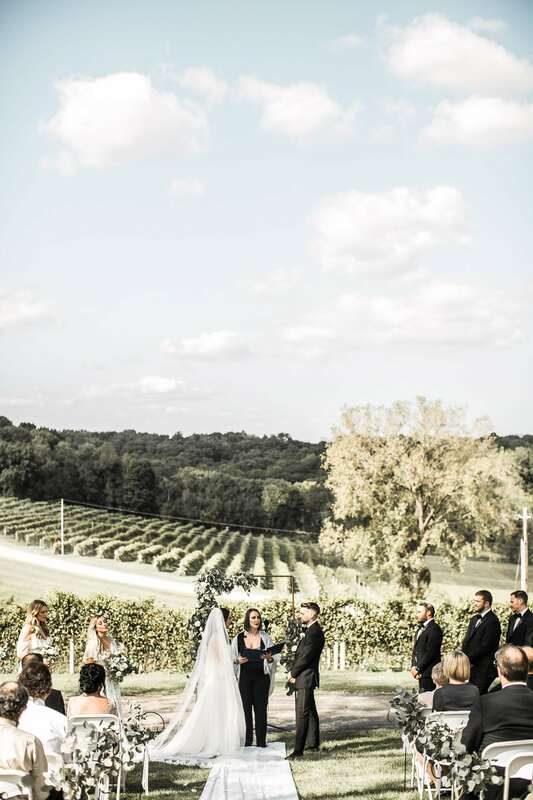 We were honored to make it happen. 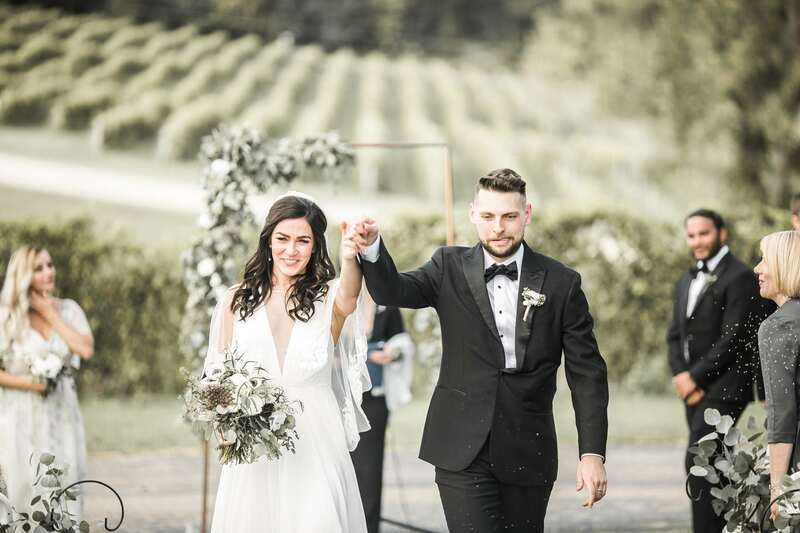 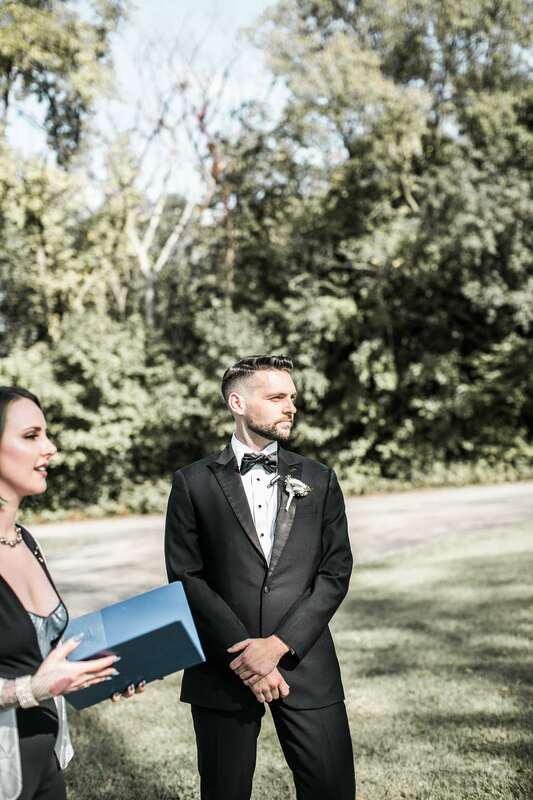 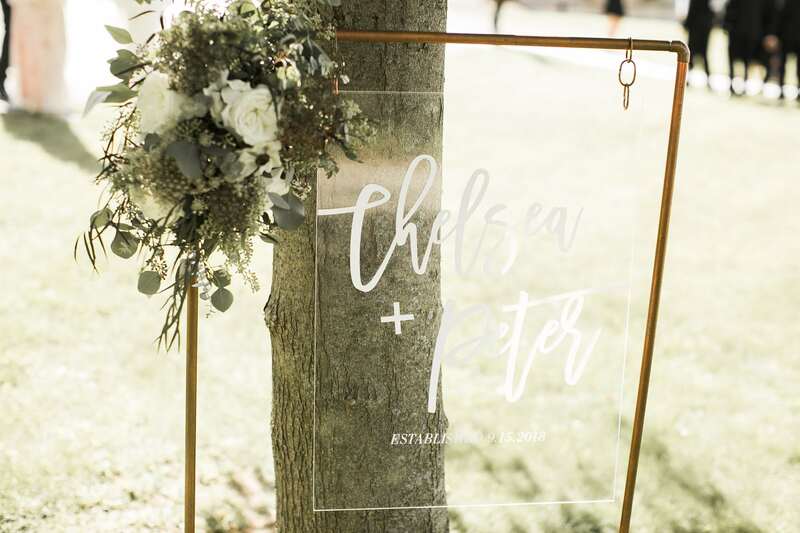 Chelsea and Peter’s unforgettable day began at Park Farm Winery in Bankston for a beautiful, late afternoon, outdoor ceremony. 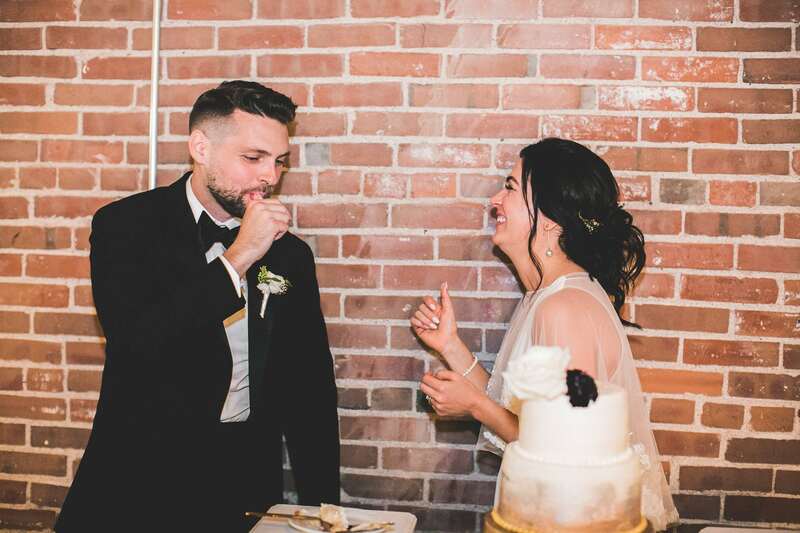 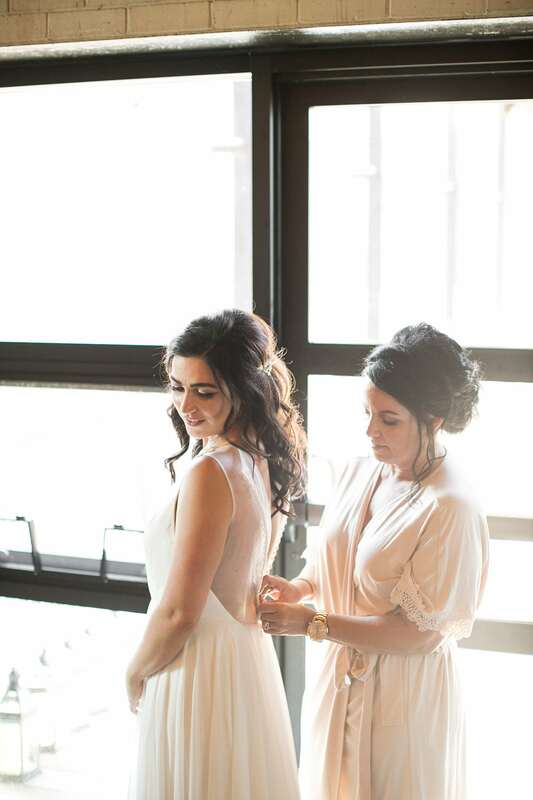 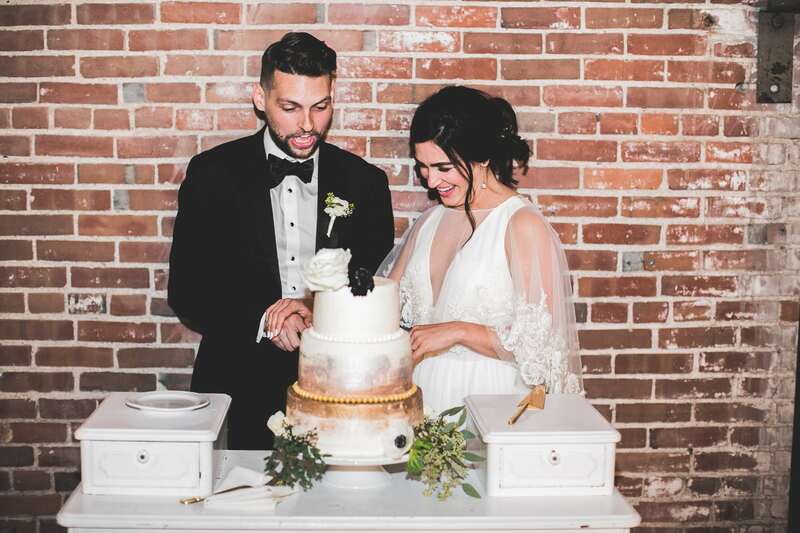 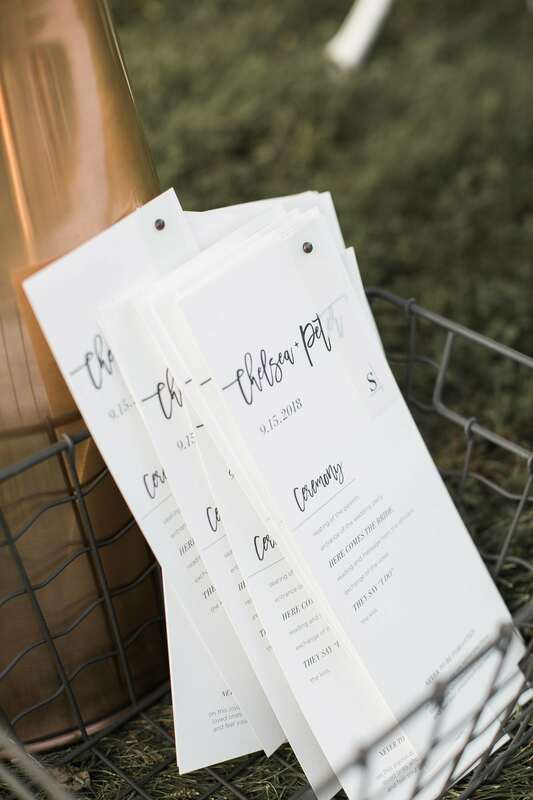 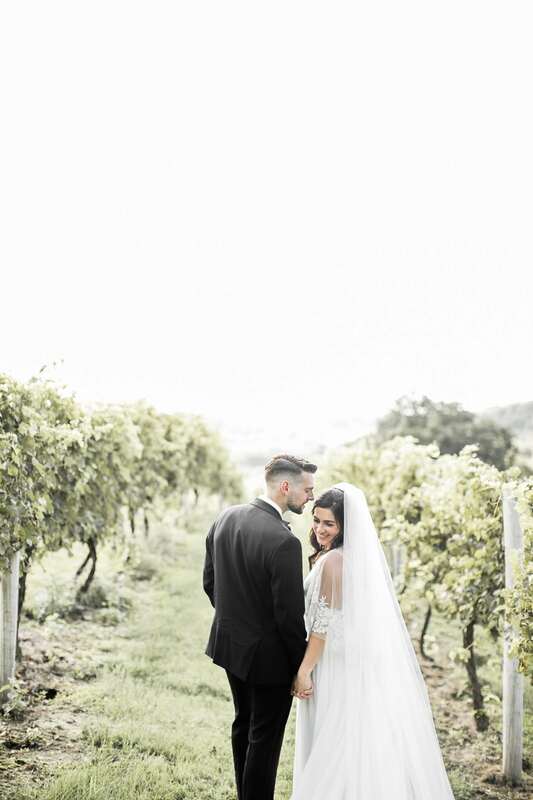 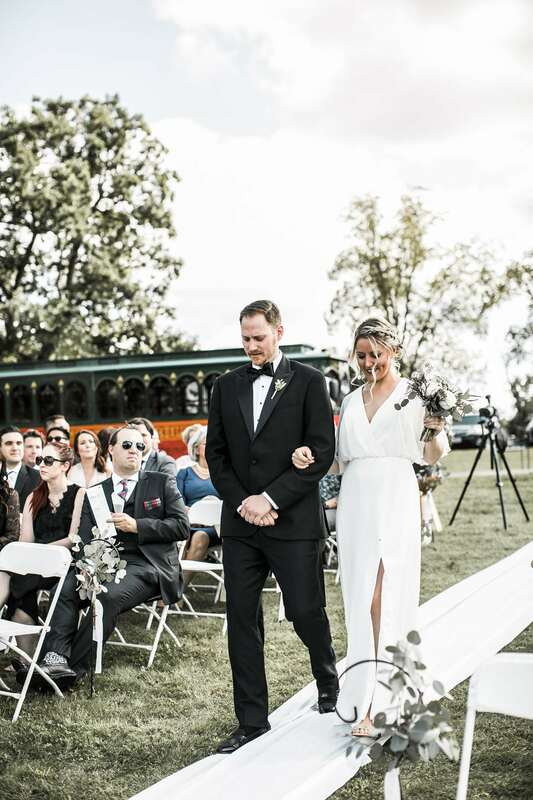 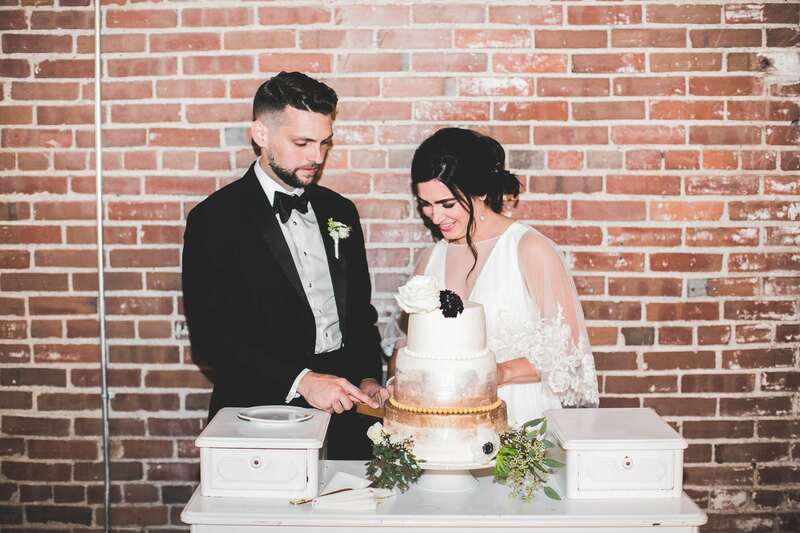 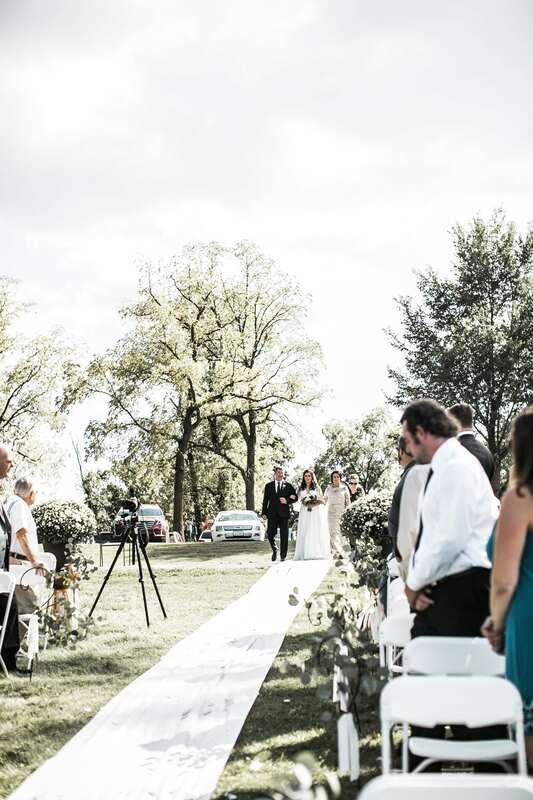 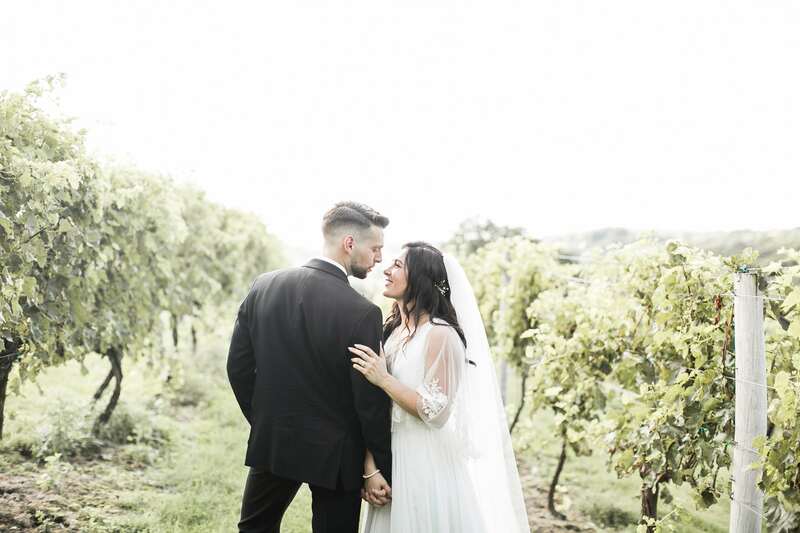 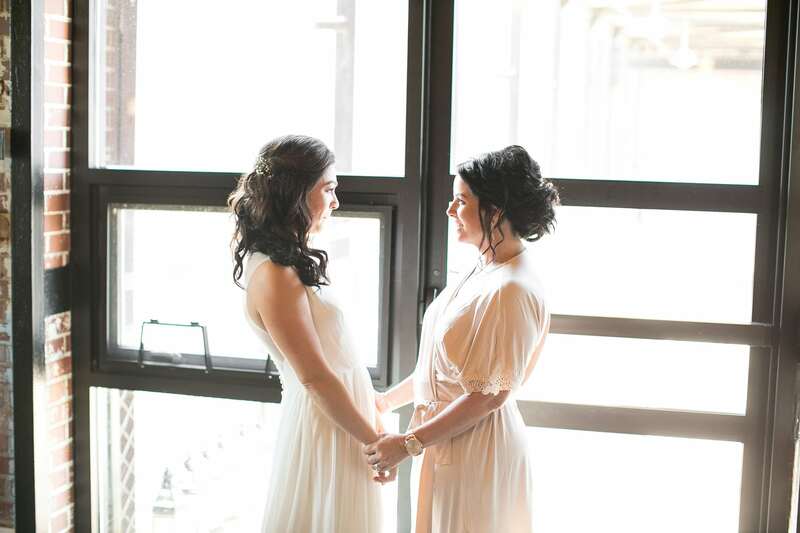 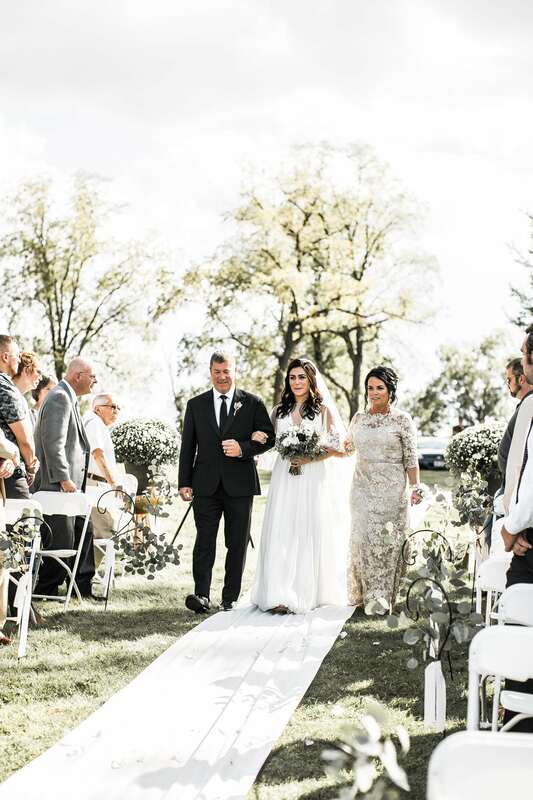 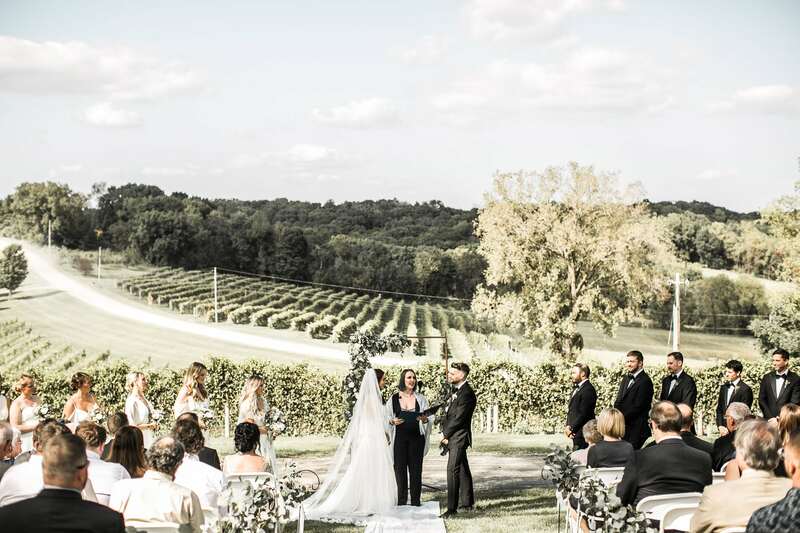 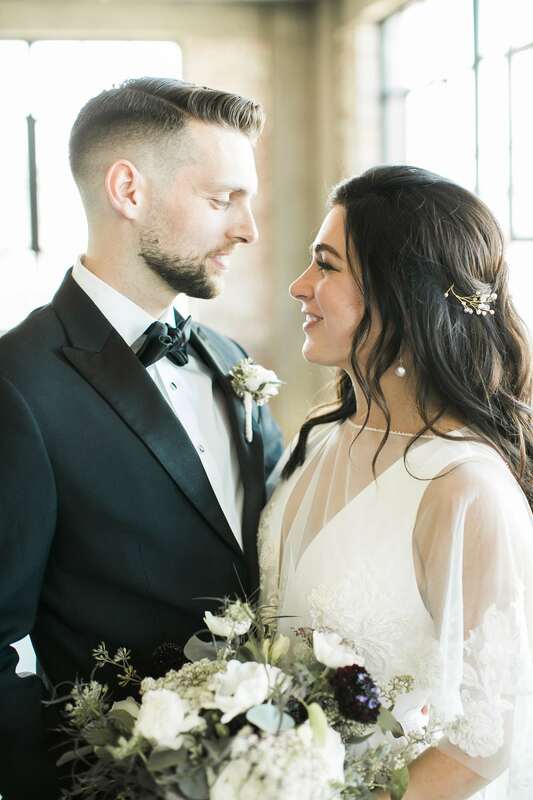 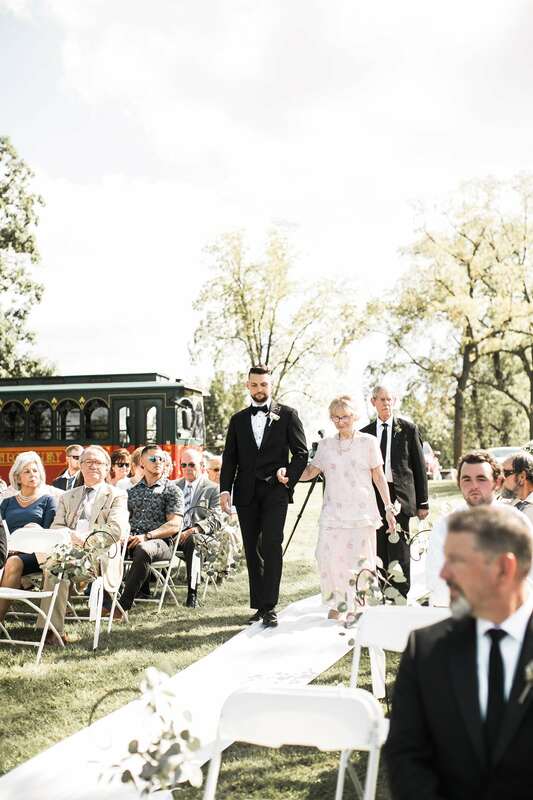 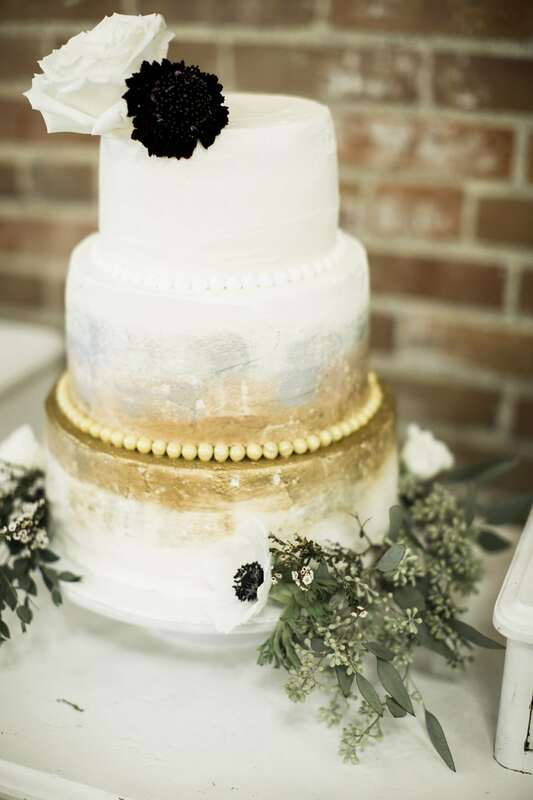 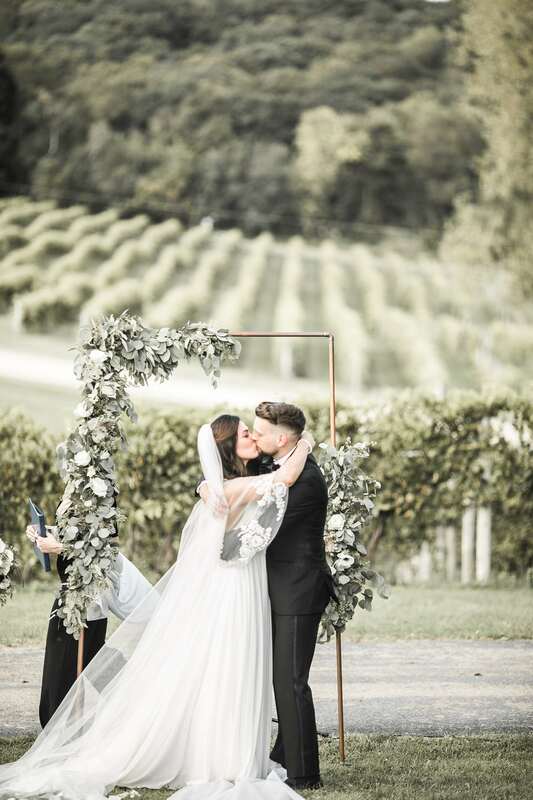 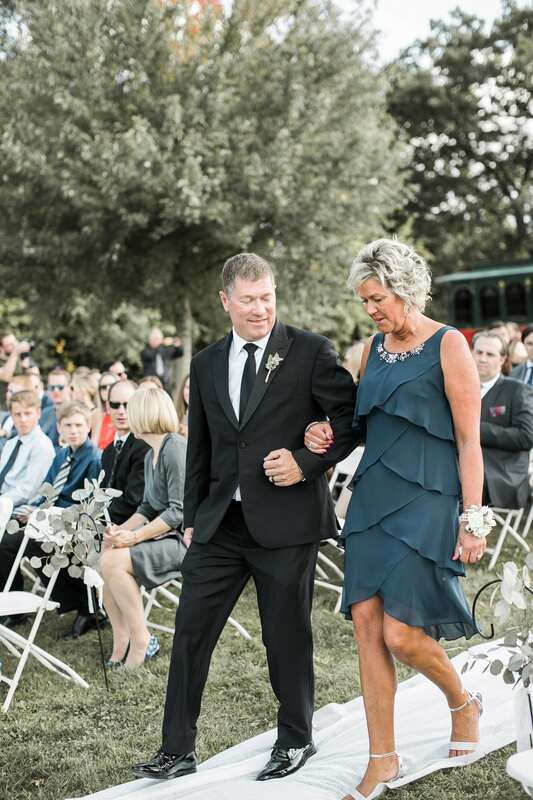 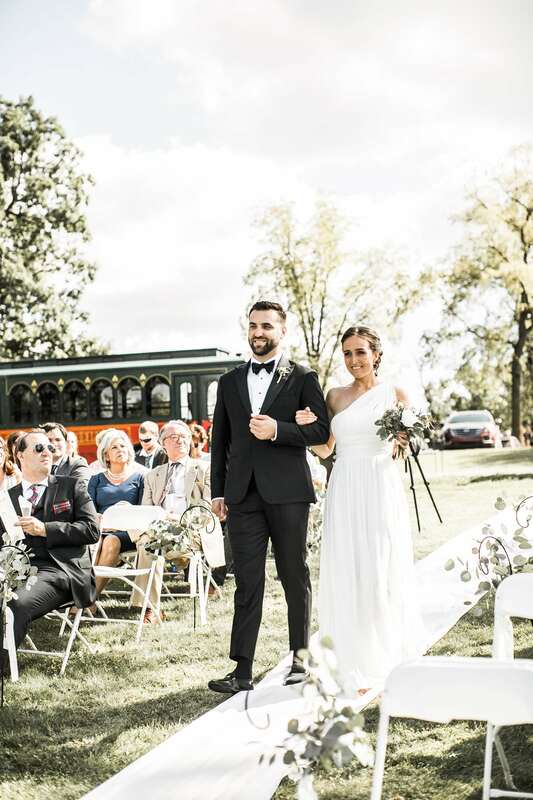 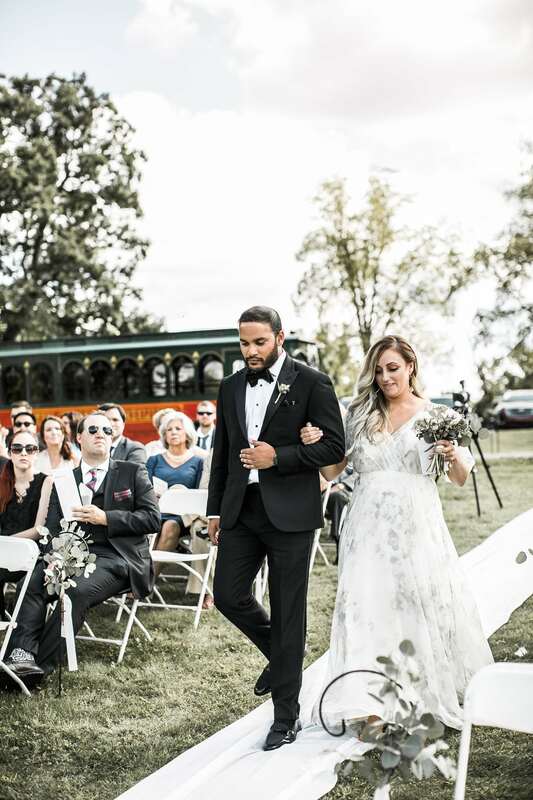 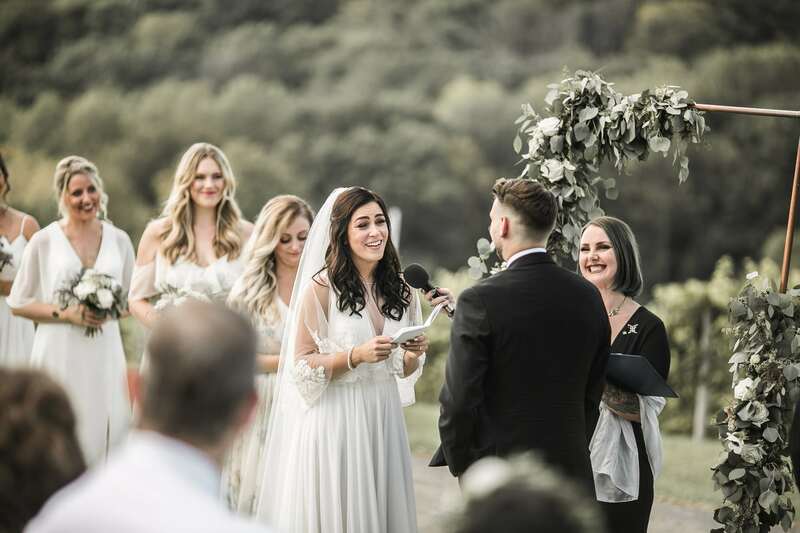 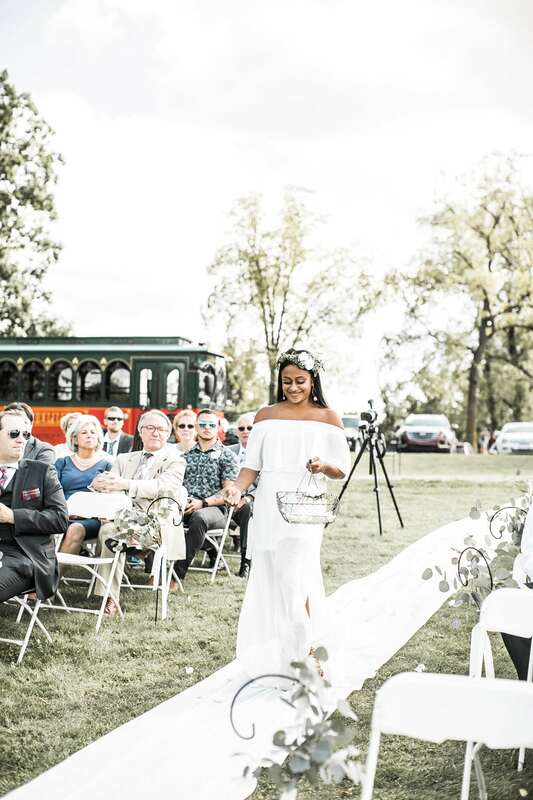 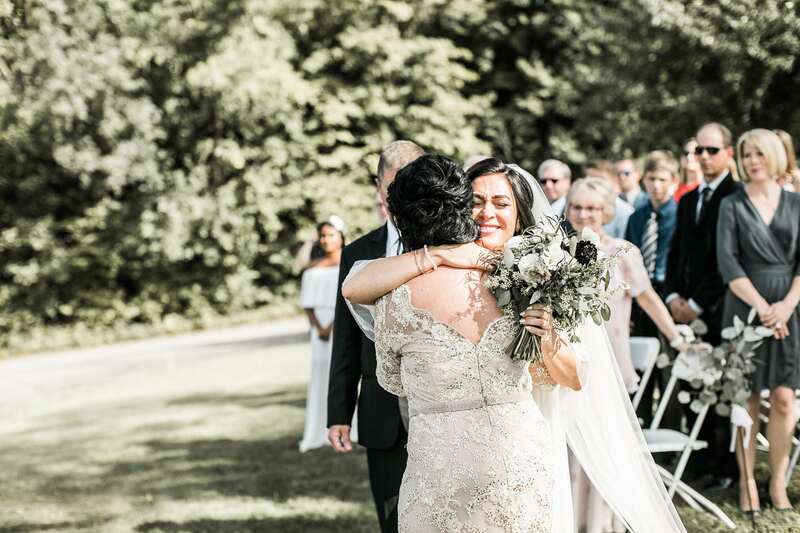 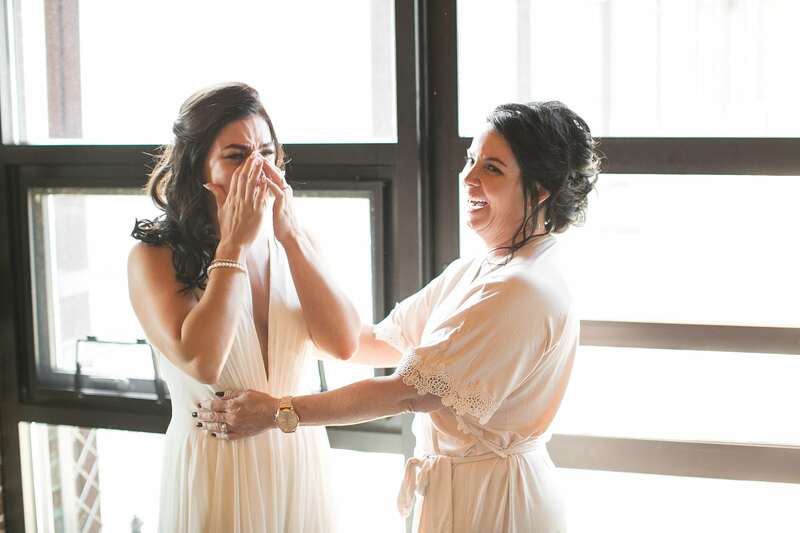 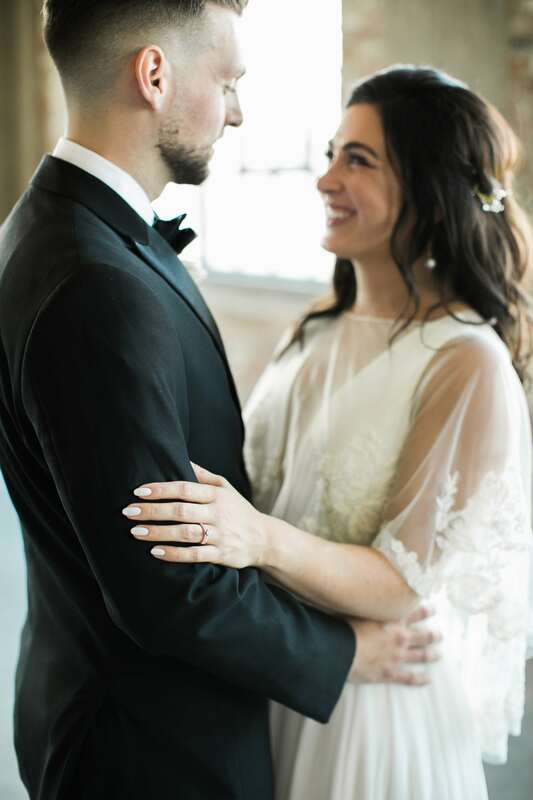 The winery, a perfect setting to exchange their vows resembled a French villa, perched on rolling Iowa pastures, vineyards and clear blue skies. 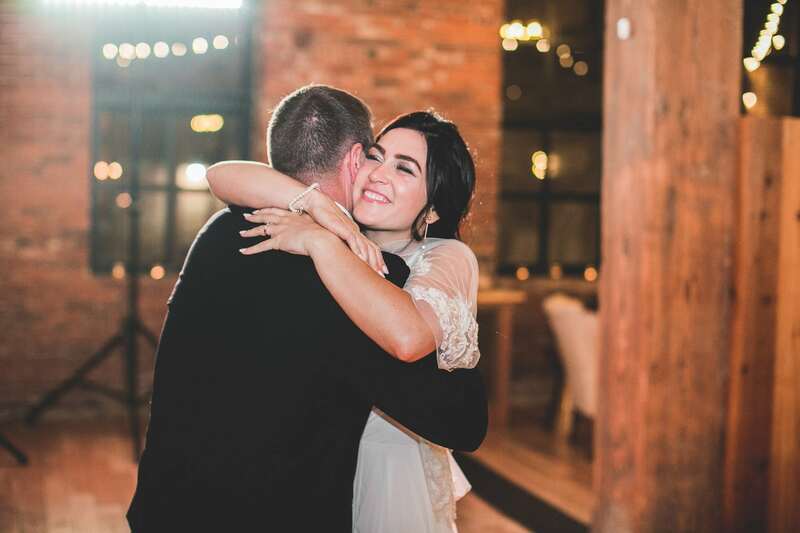 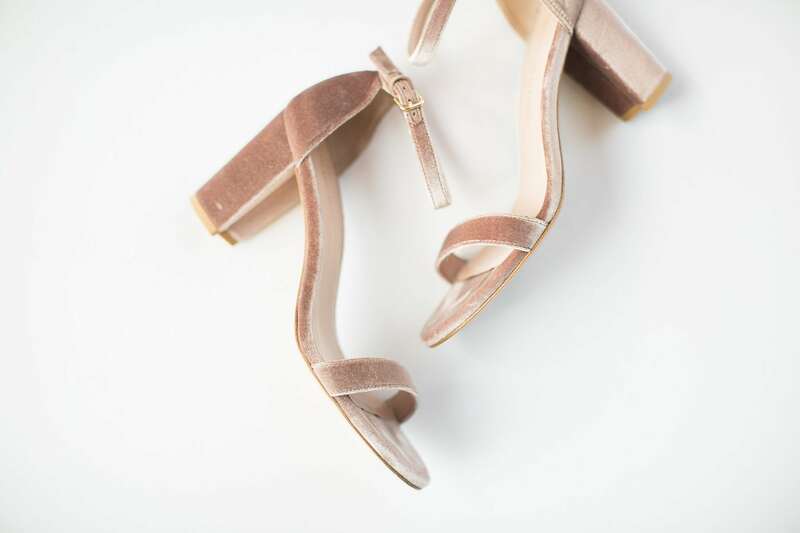 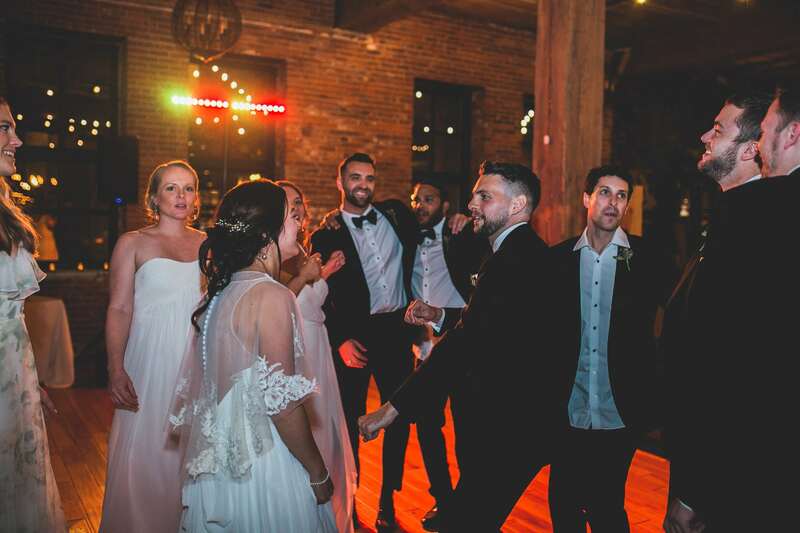 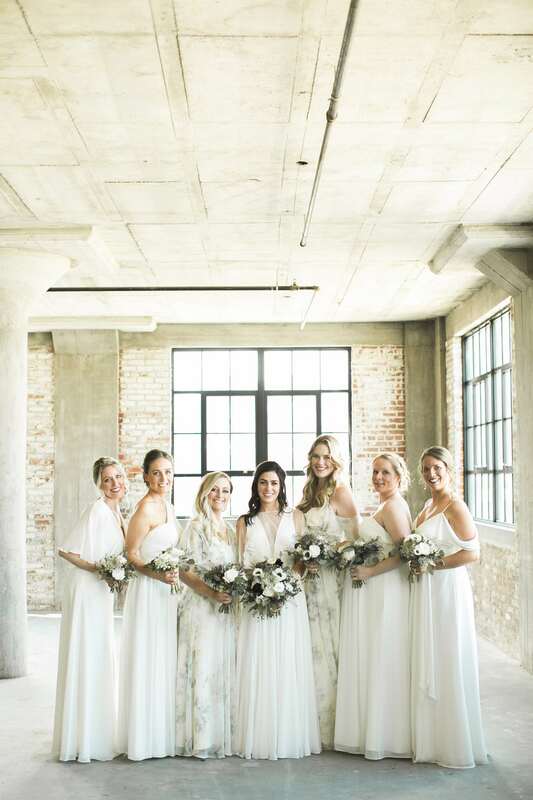 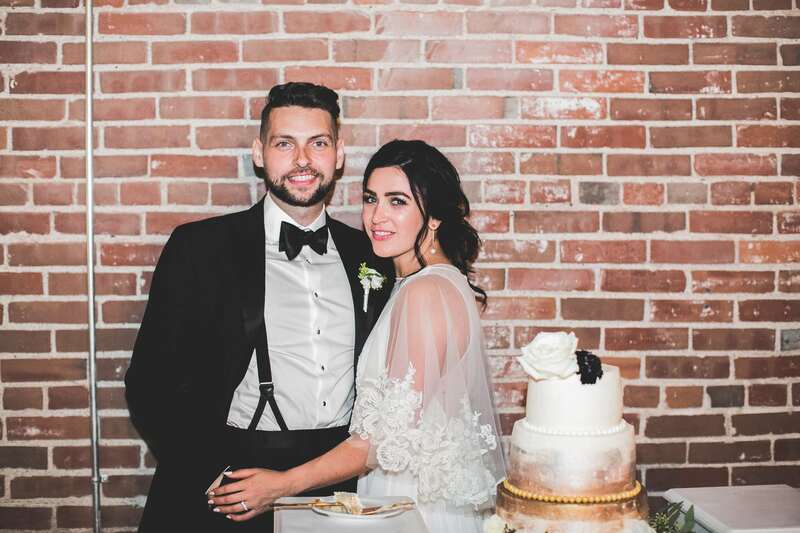 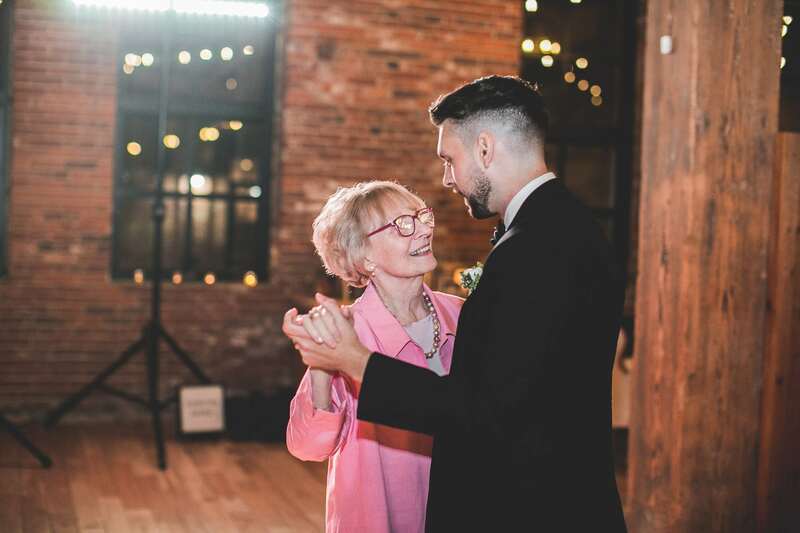 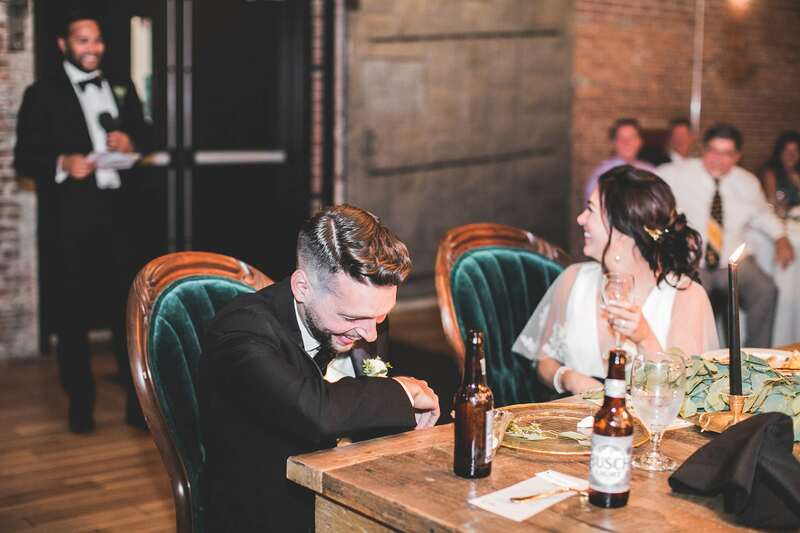 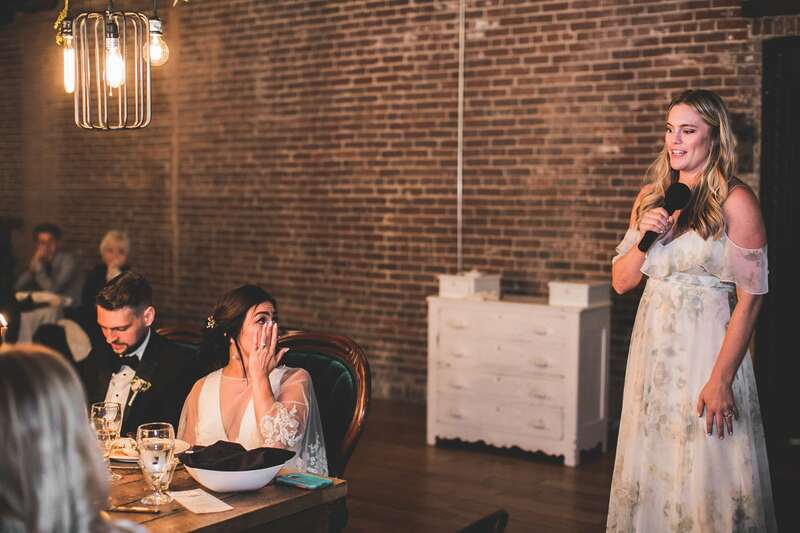 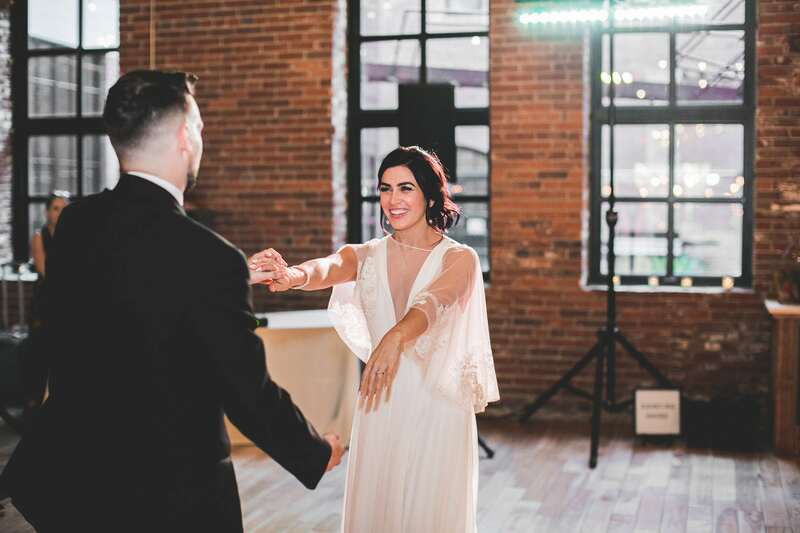 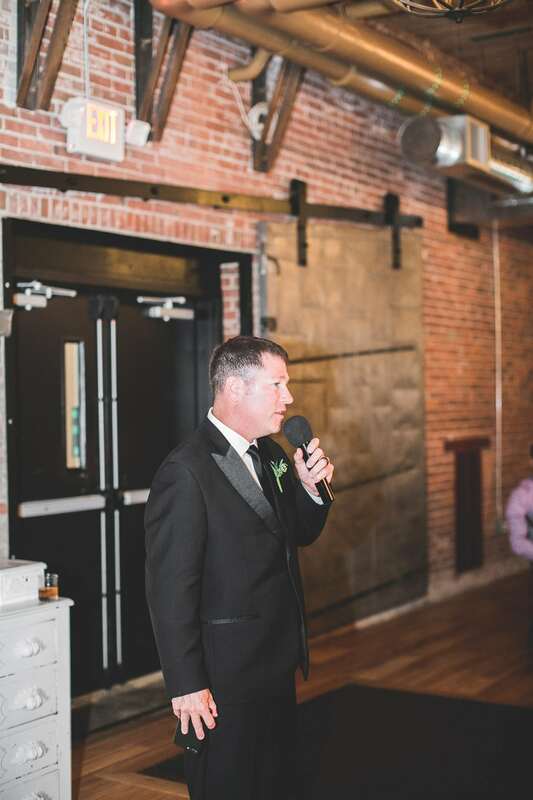 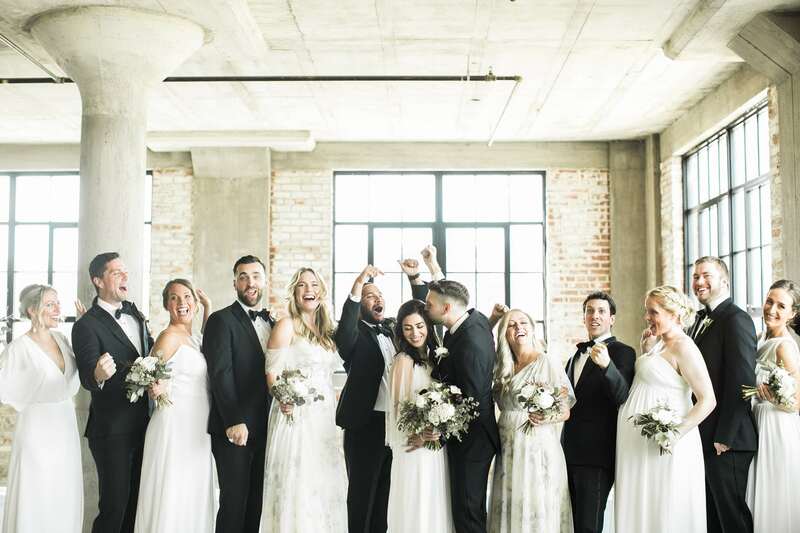 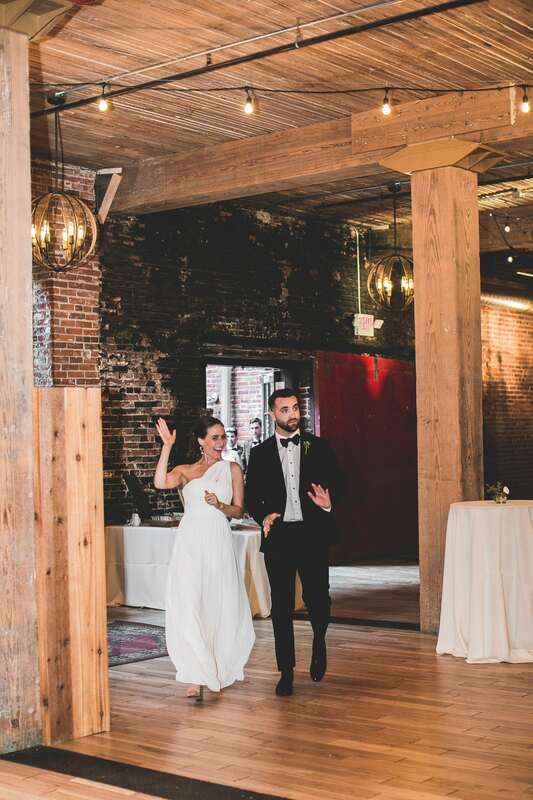 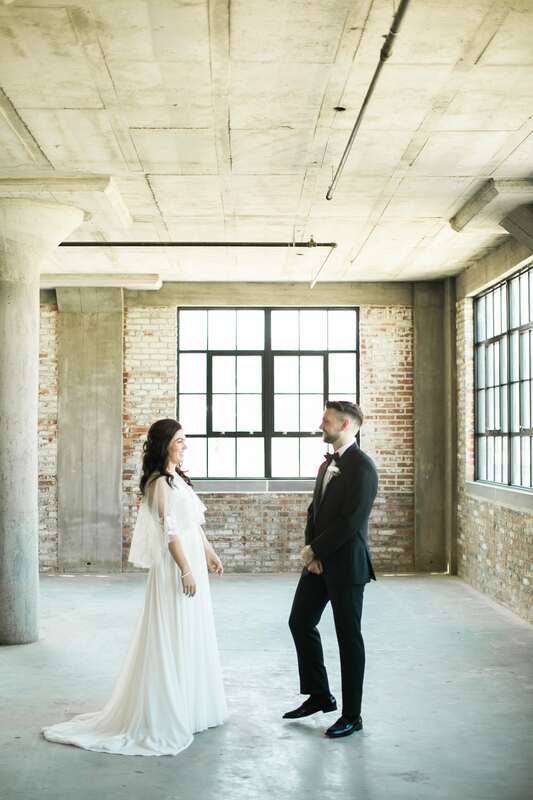 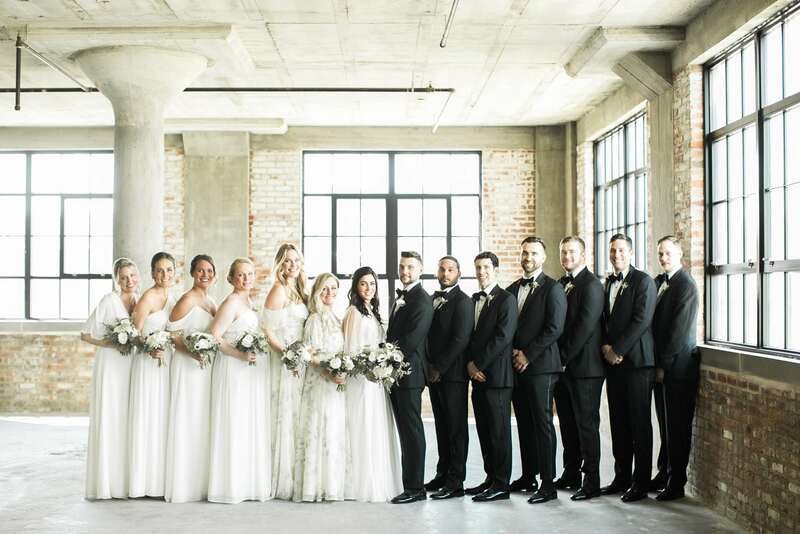 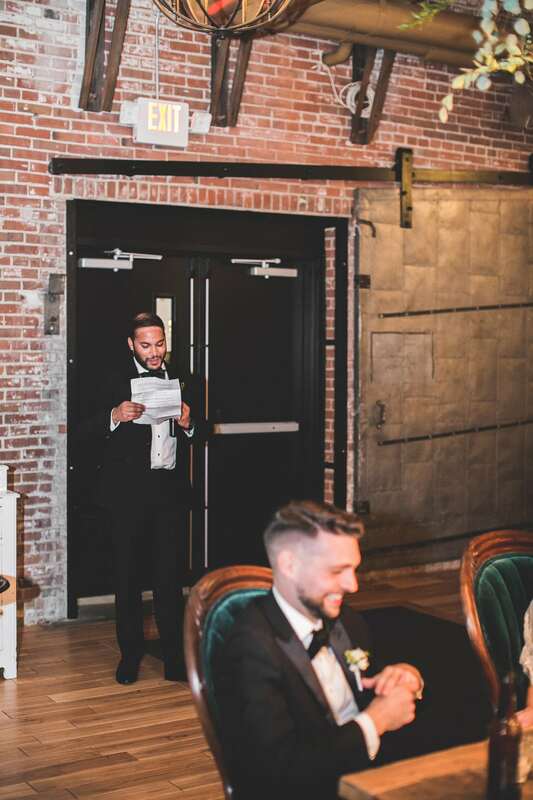 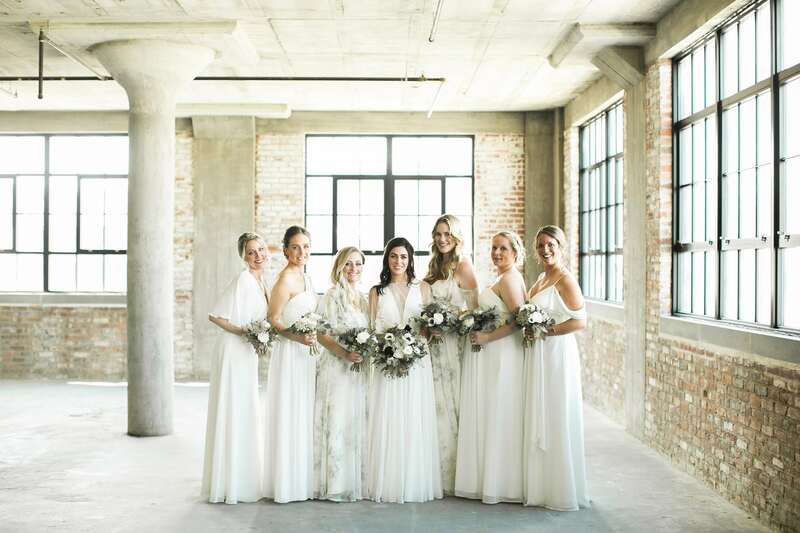 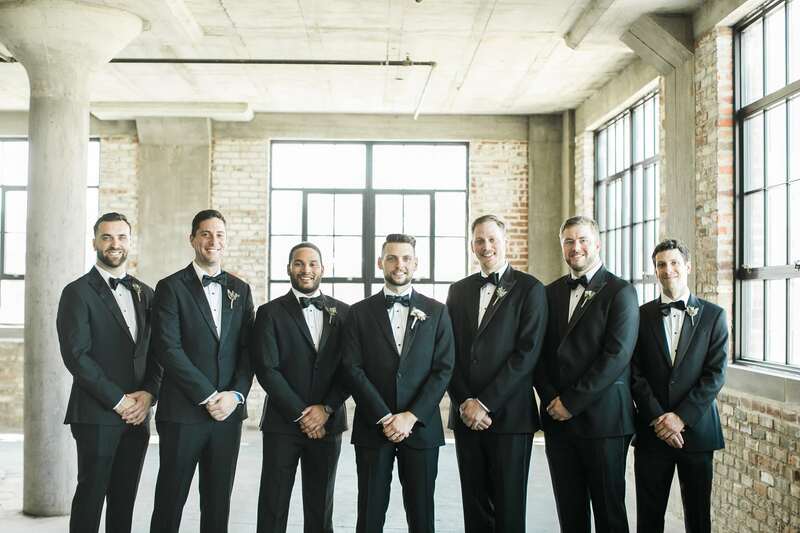 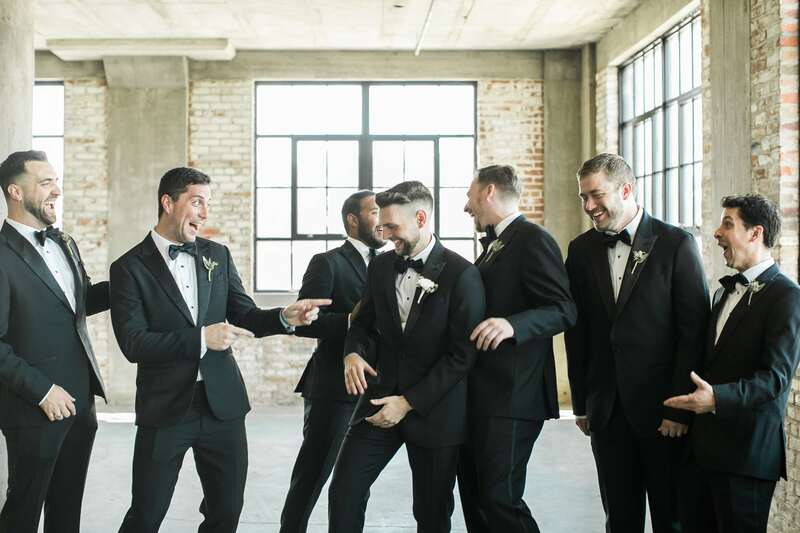 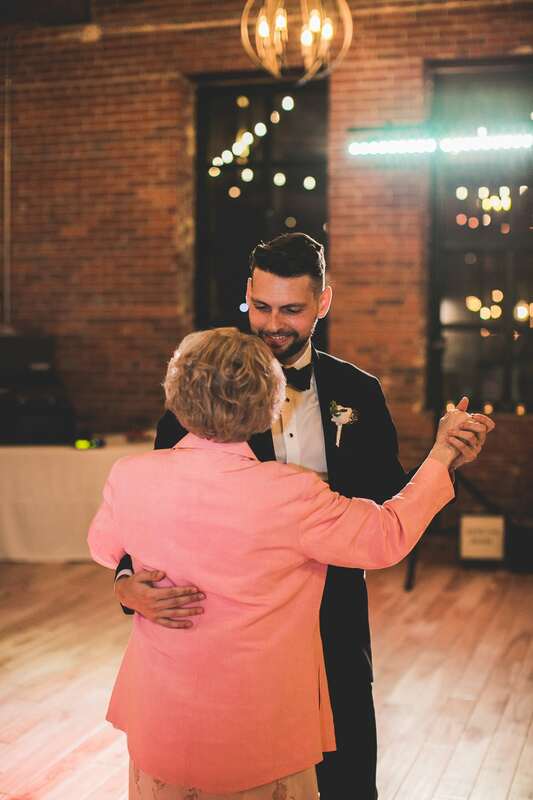 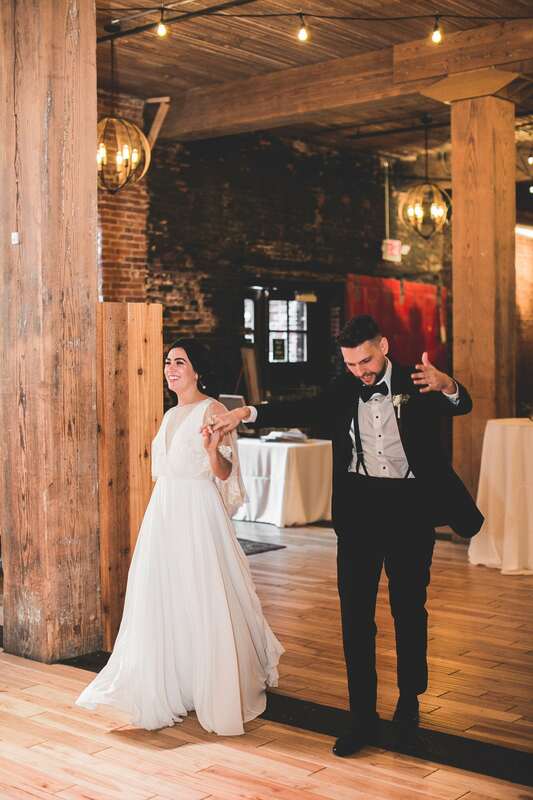 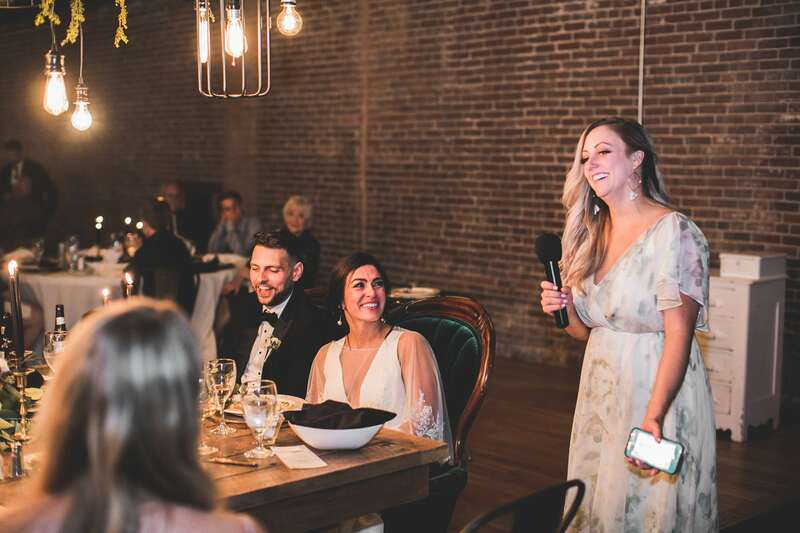 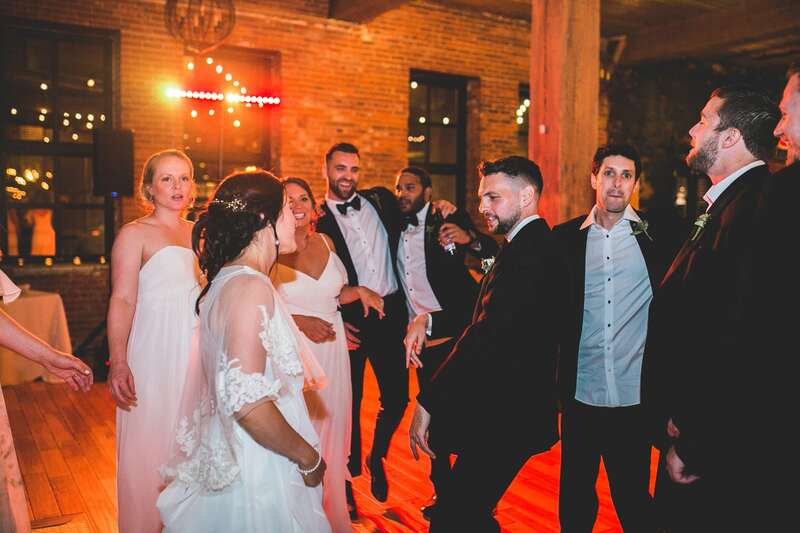 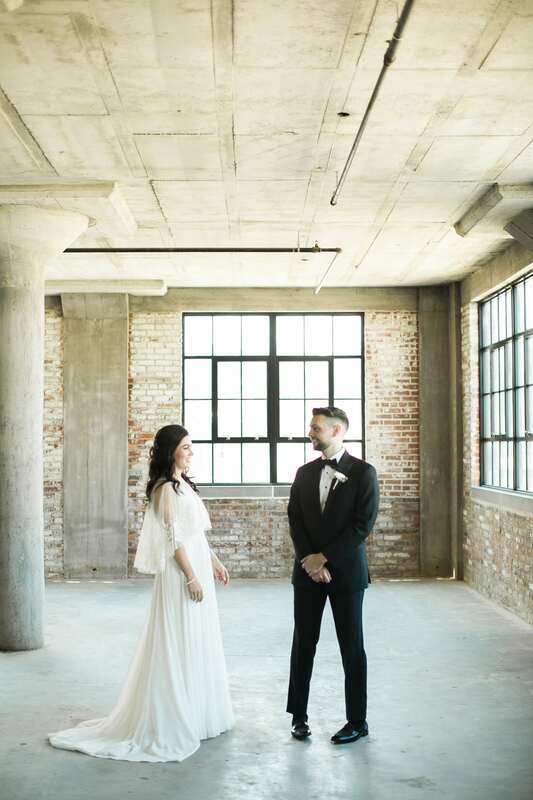 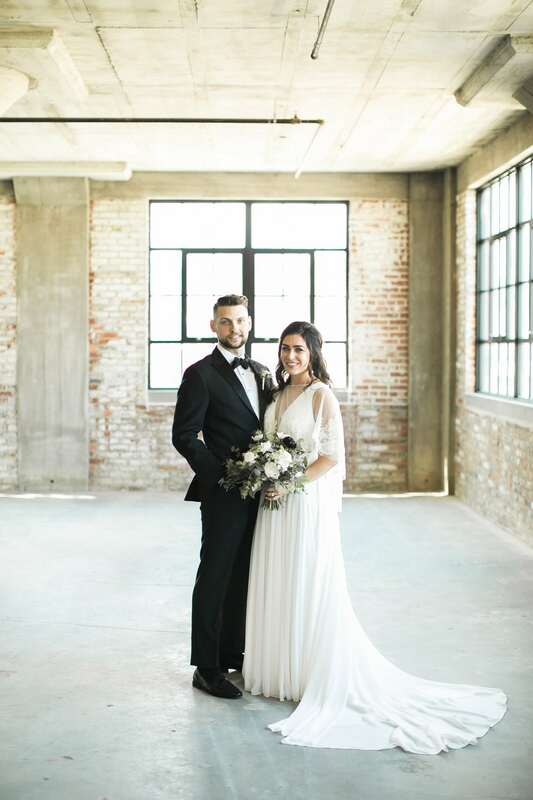 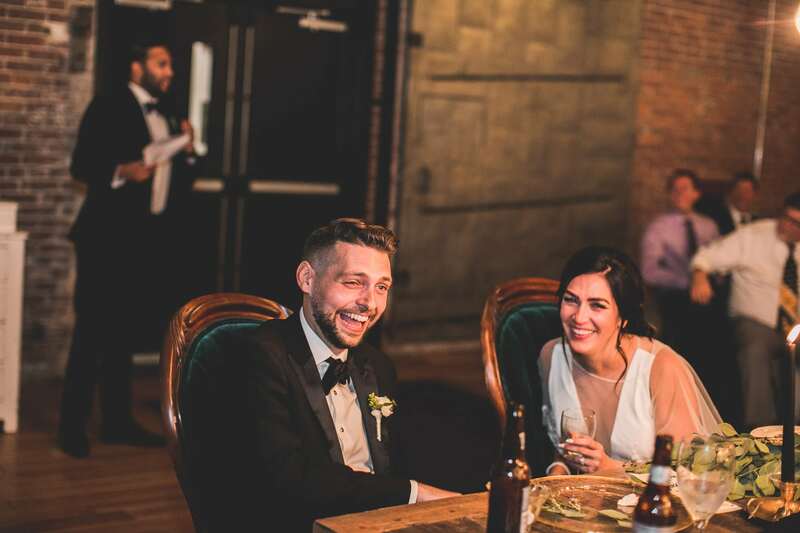 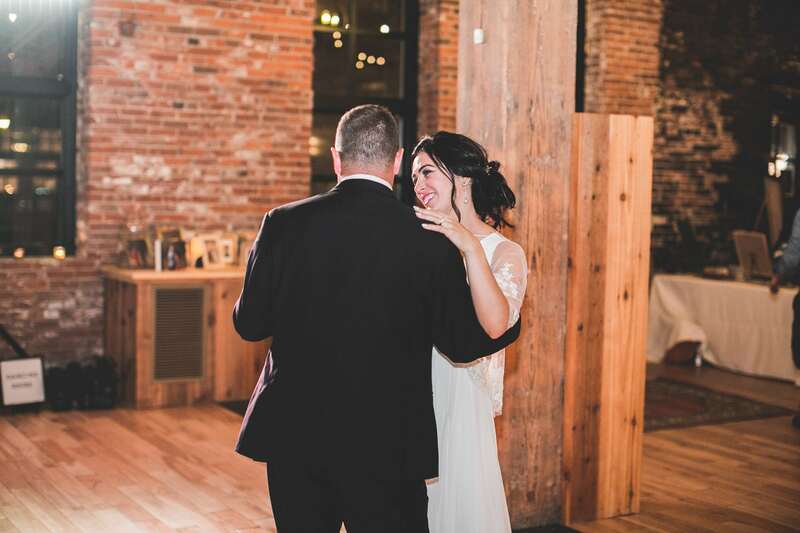 After the ceremony, the bride and groom hosted family and friends for cocktails, dinner, and dancing at the Millwork Ballroom. 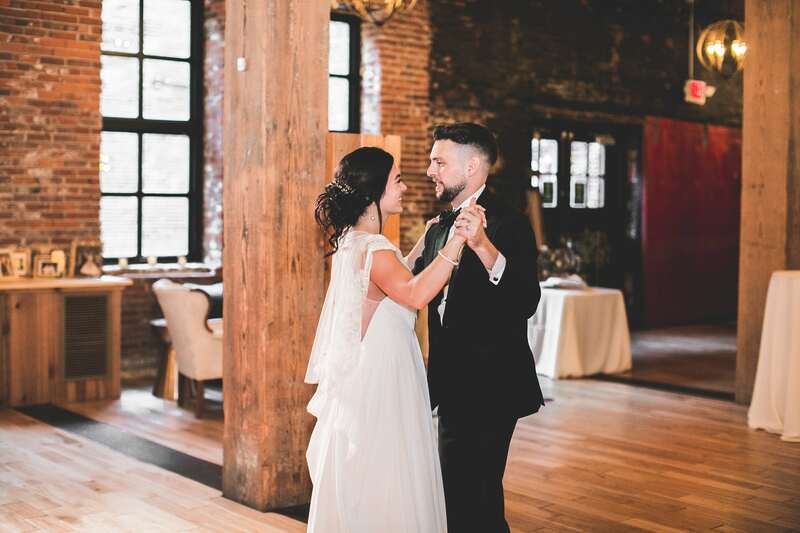 One of the elements we loved about Chelsea and Peter’s wedding was the feeling we had when we walked into the Millwork Ballroom. 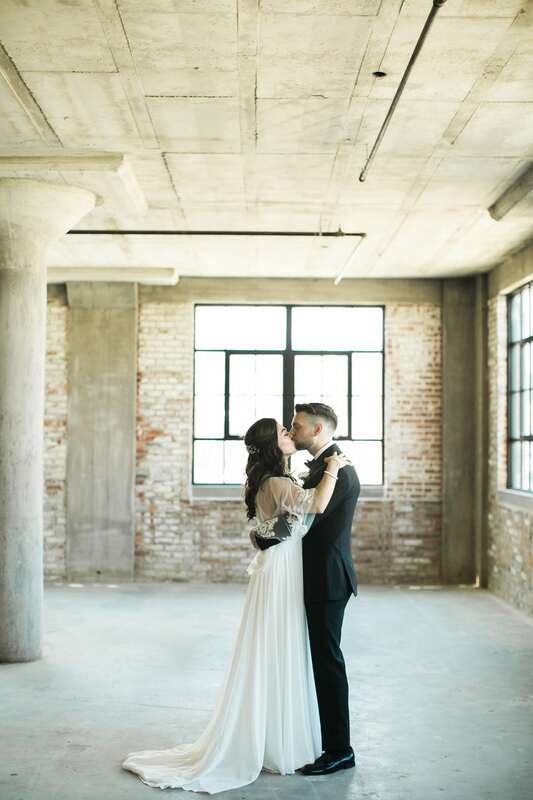 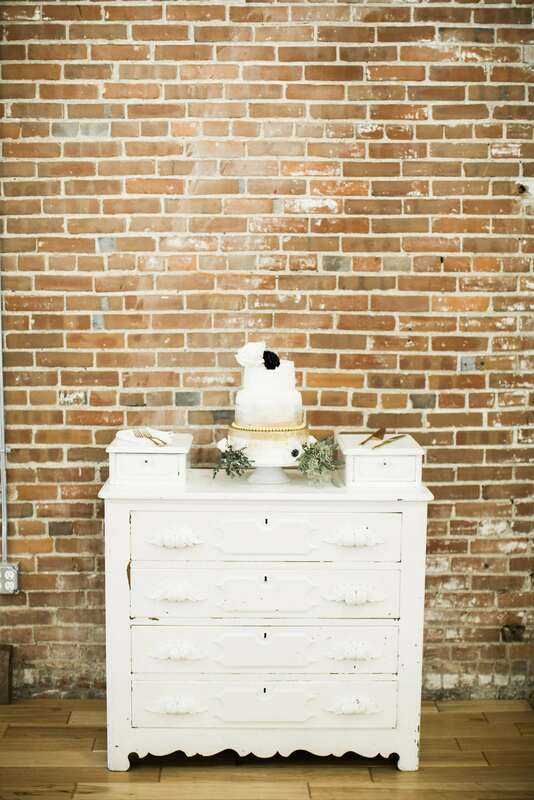 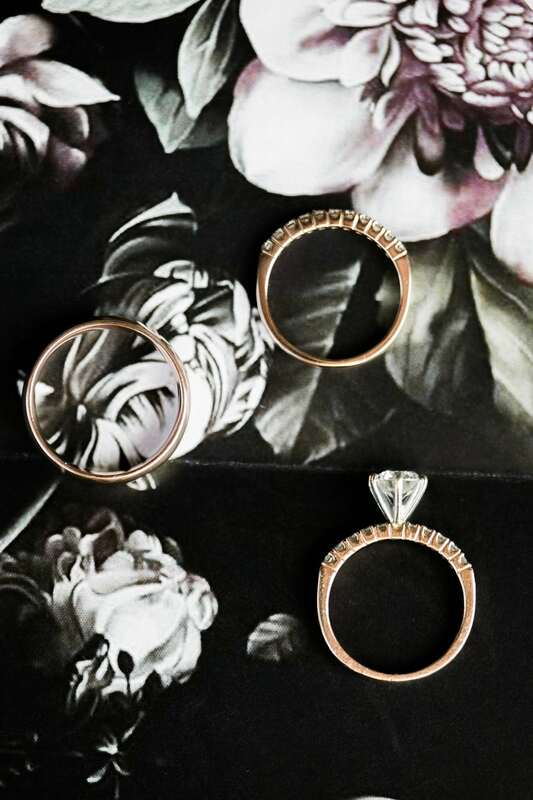 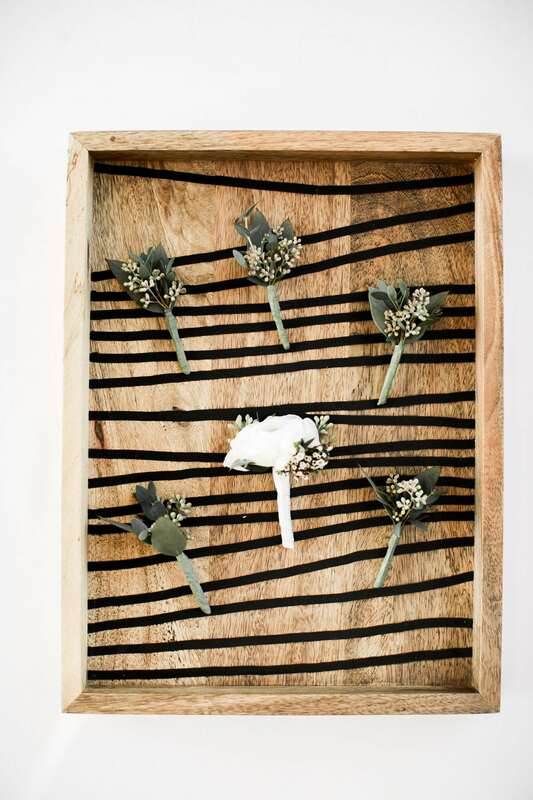 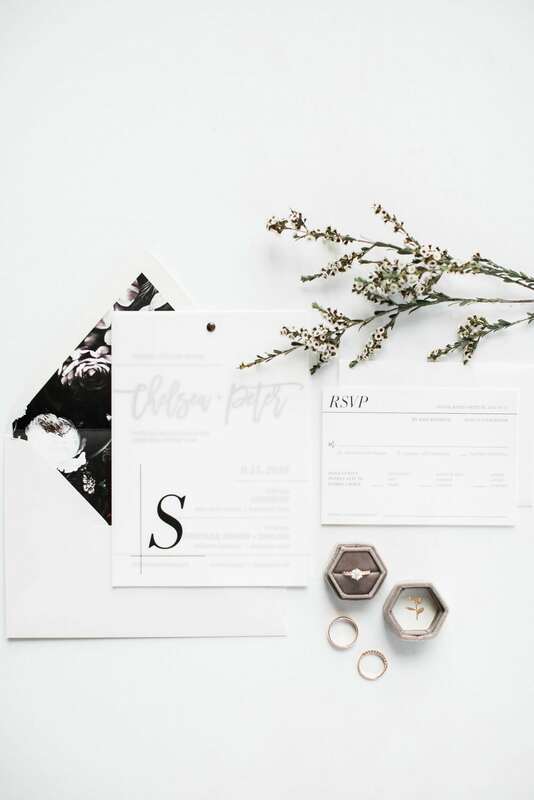 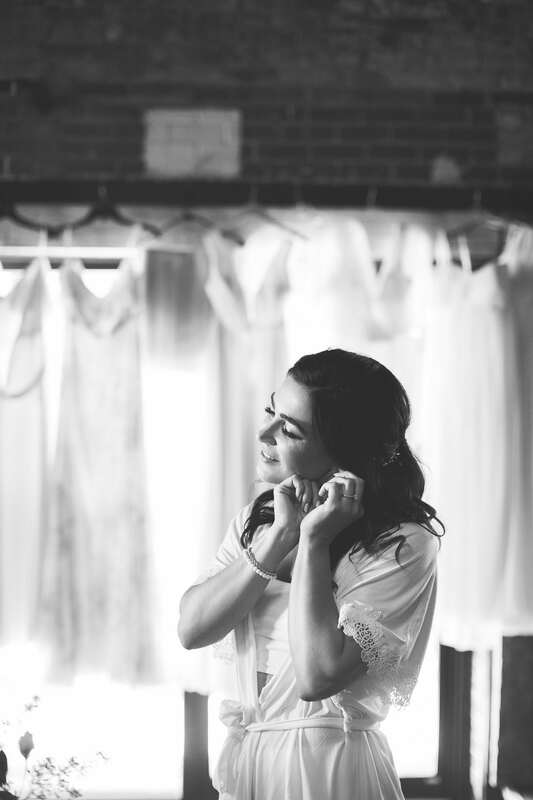 There was a certain trendy aesthetic that you could picture as a featured wedding in the pages of a magazine. 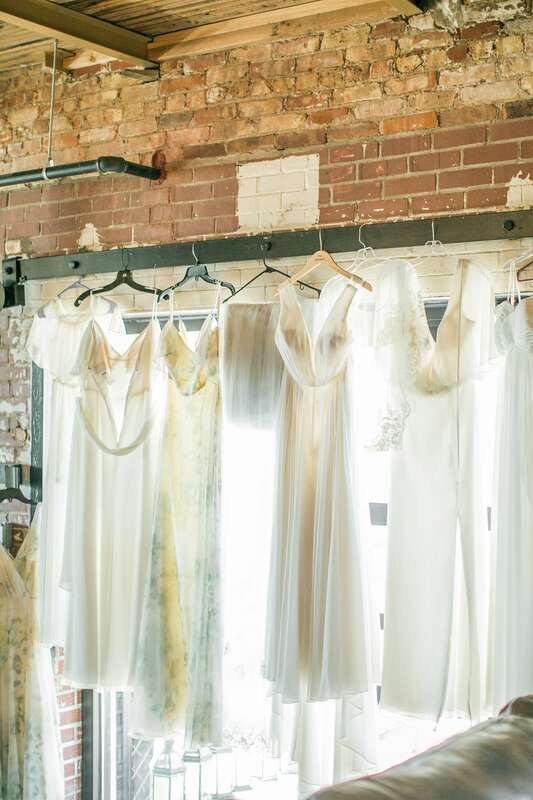 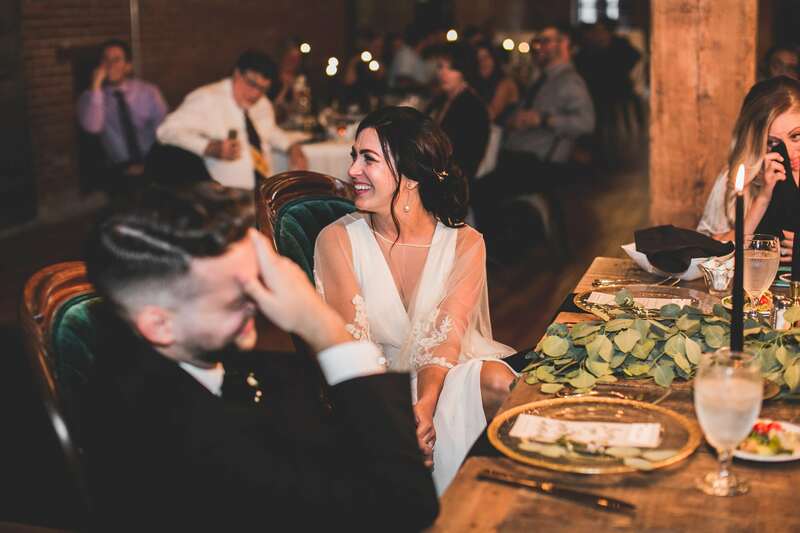 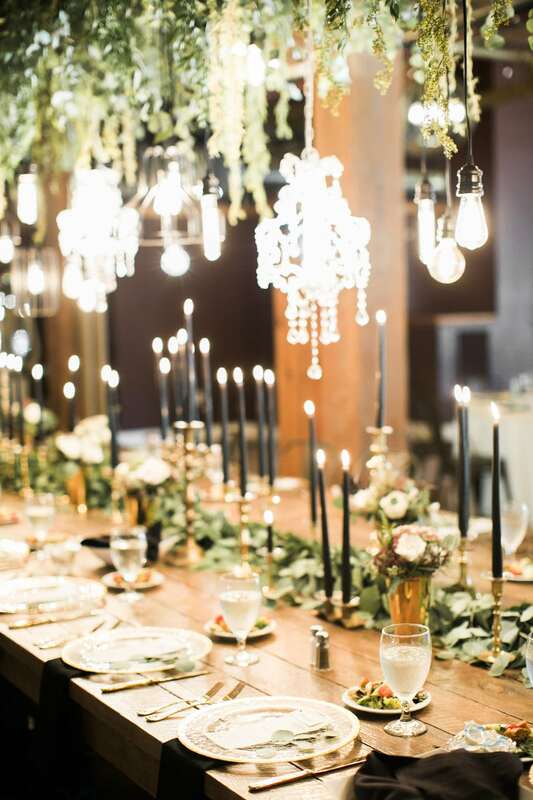 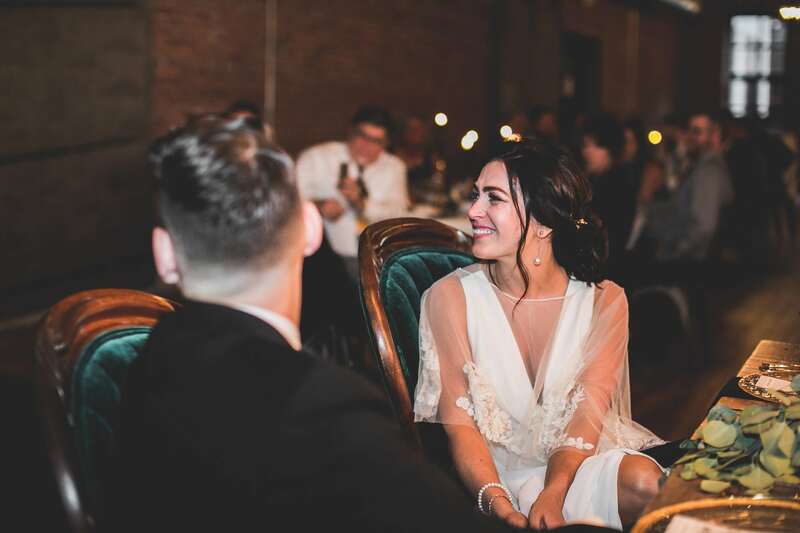 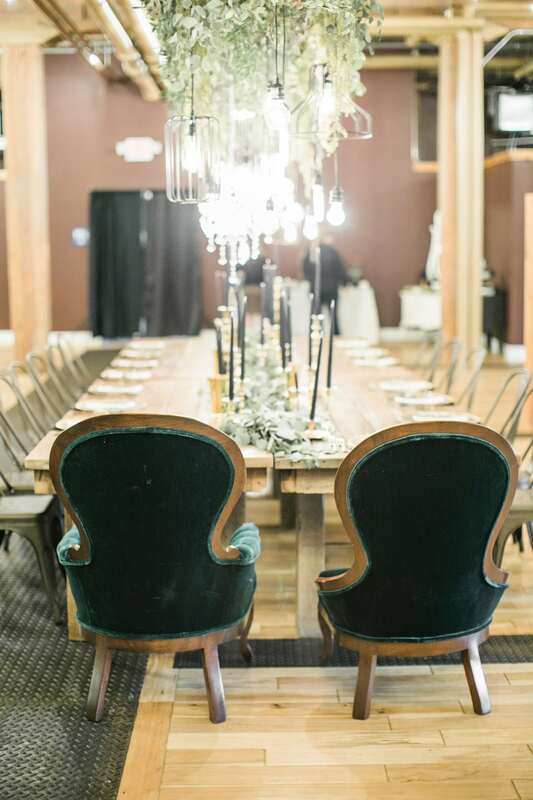 Adorned with hanging lights, chandeliers, some resembling vintage antique birdcages, hanging above a rustic Harvest Table; the scene could not have been more magical. 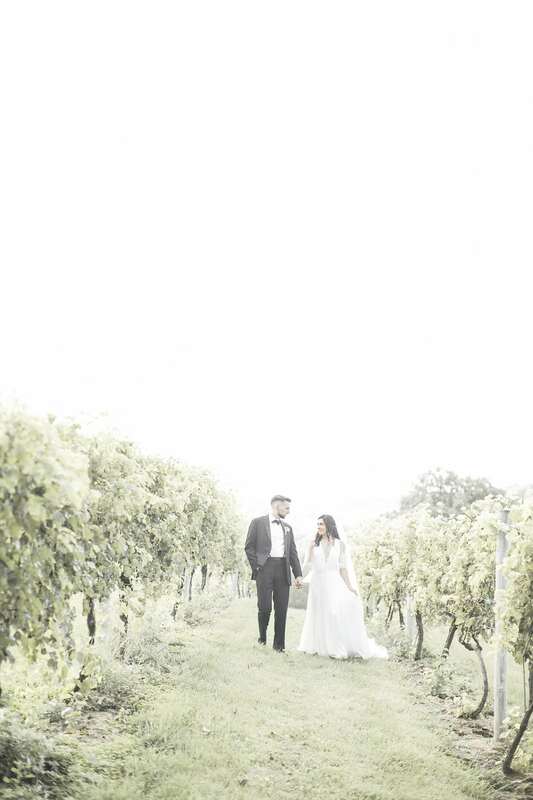 We felt as if we had been transported to a European castle. 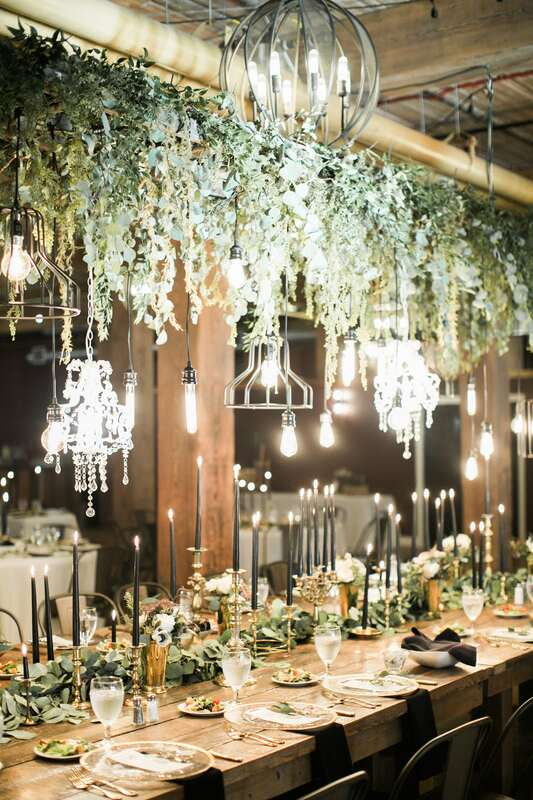 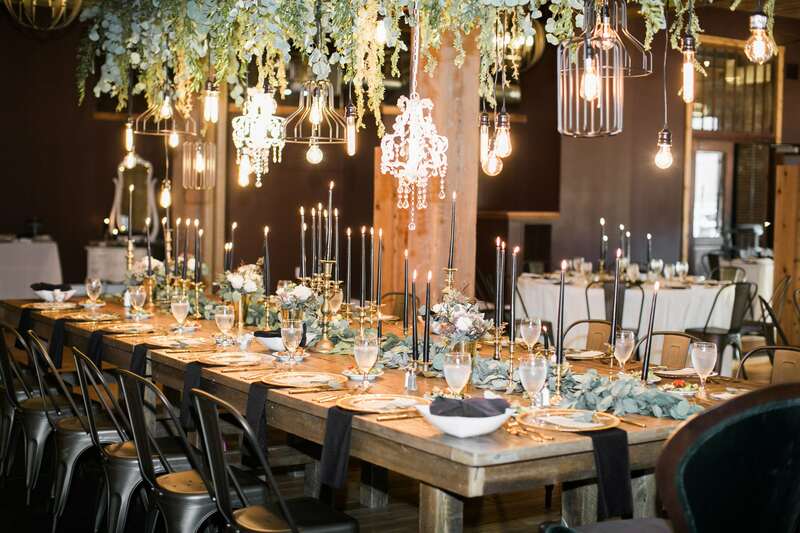 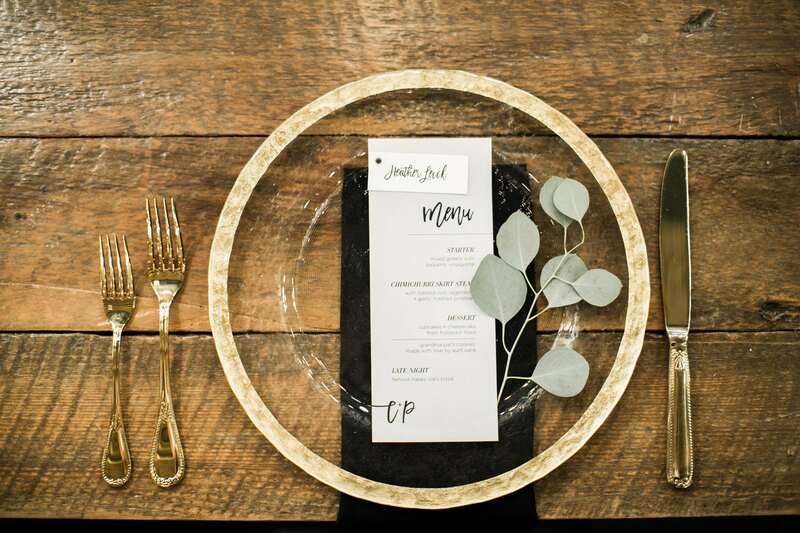 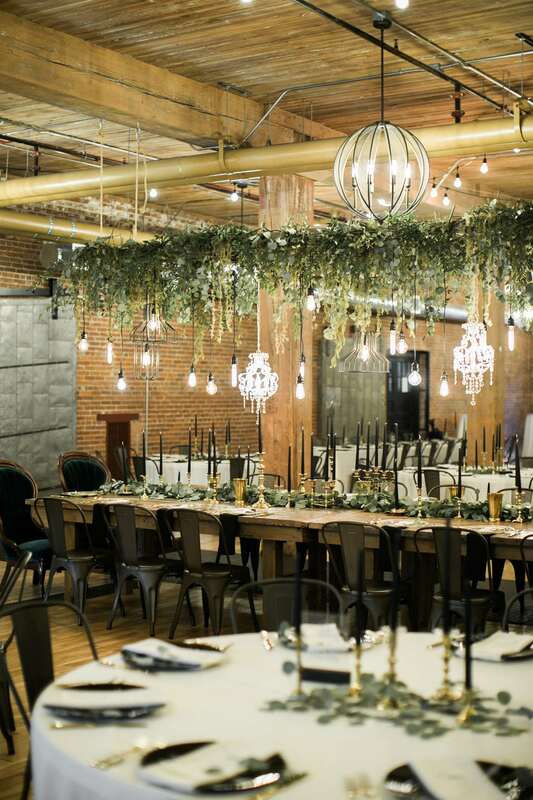 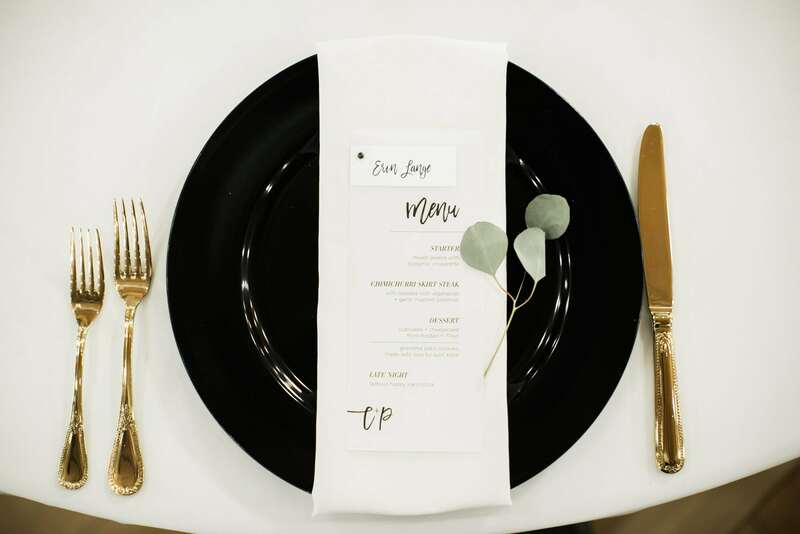 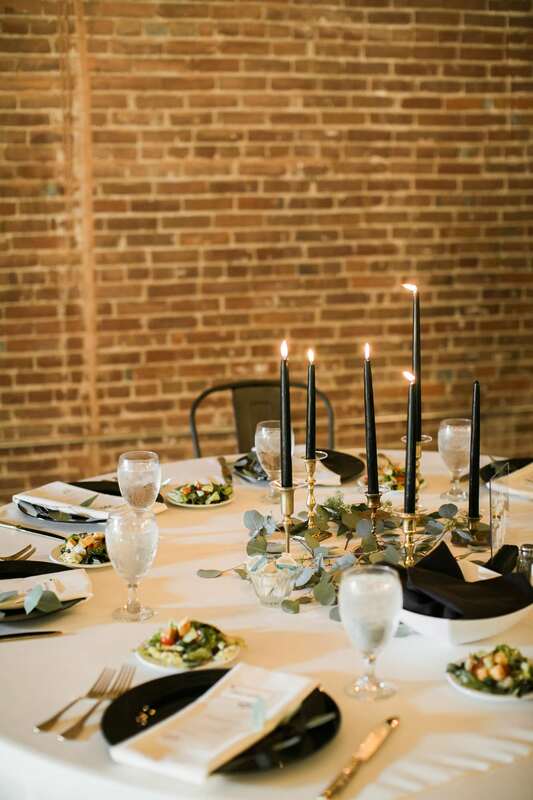 Above the table, and in the centerpiece, greenery surrounded the white lights, dramatic dark candles, and gold cutlery. 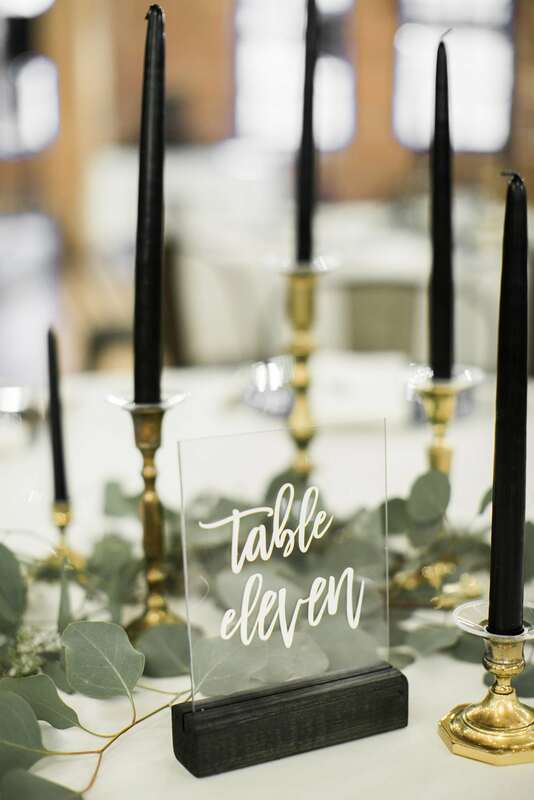 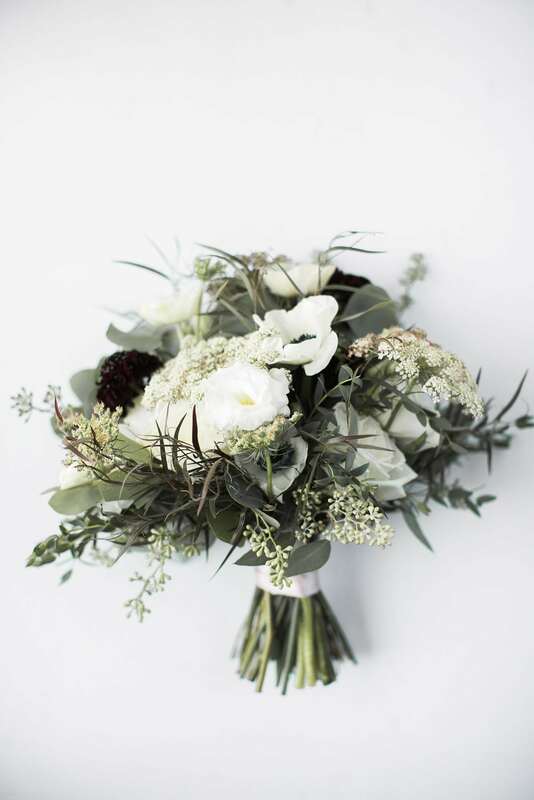 The juxtaposition of white and green florals with dramatic, black candles, all placed perfectly, at different heights was simply stunning. 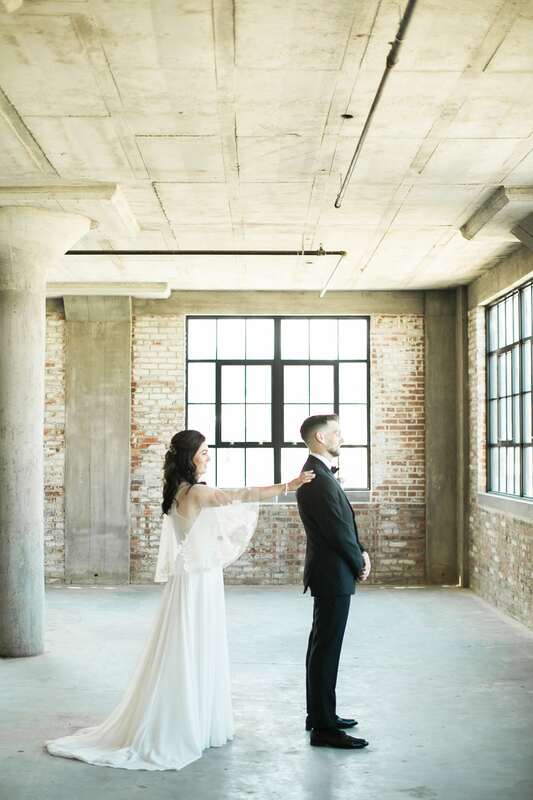 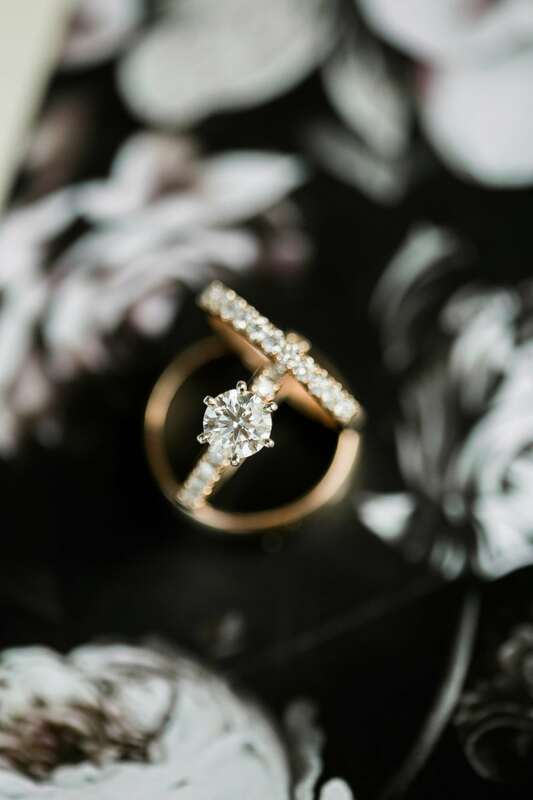 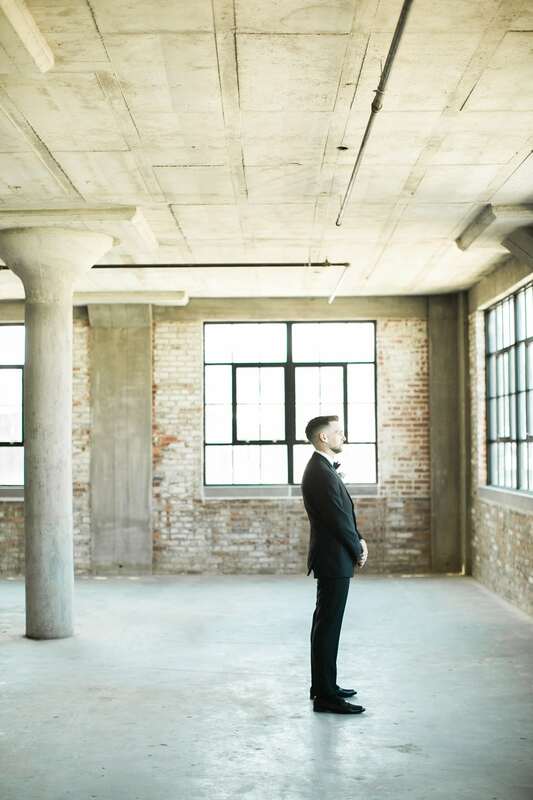 It was a perfect combination of modern, yet traditional. 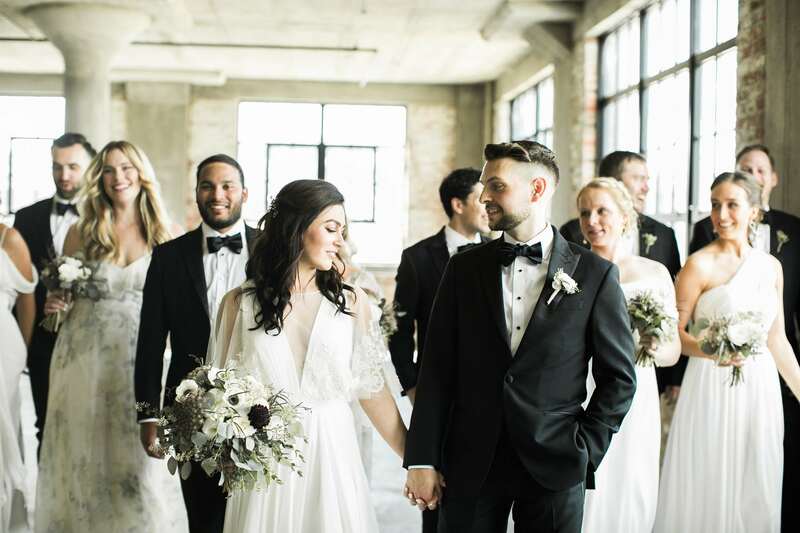 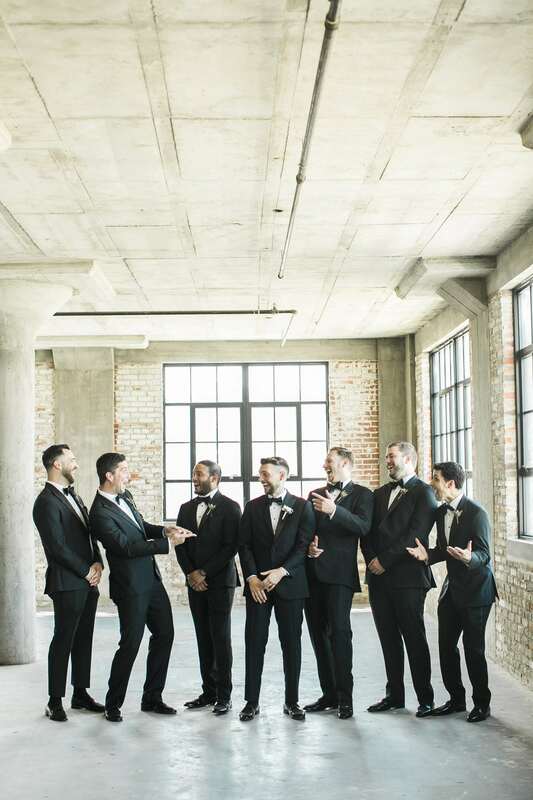 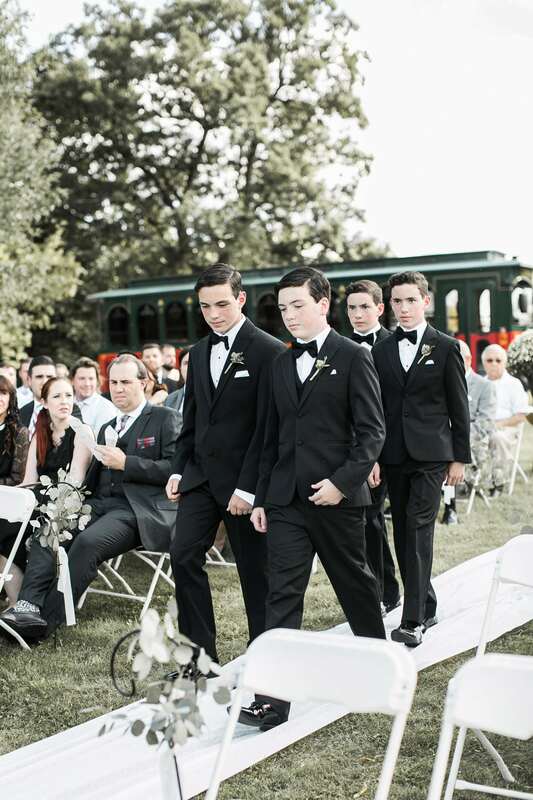 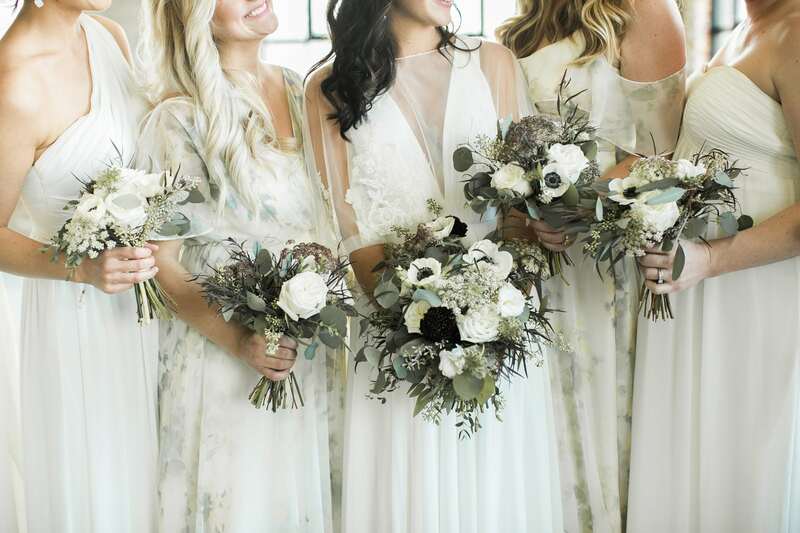 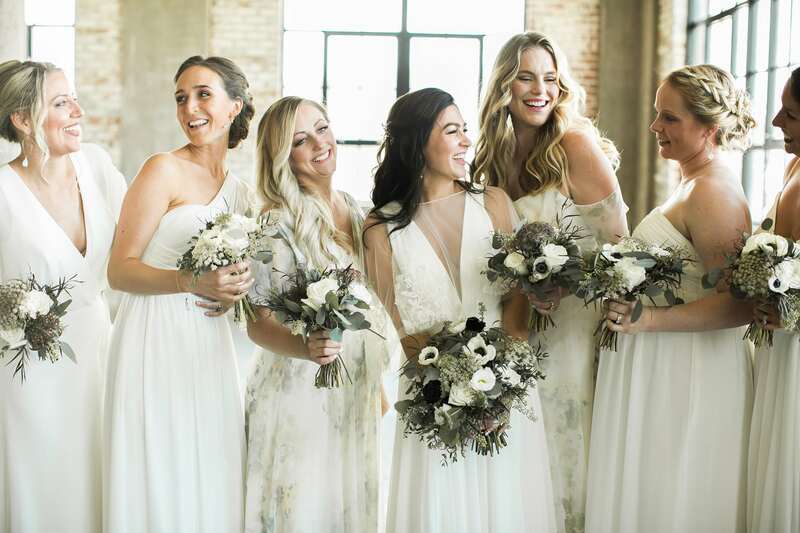 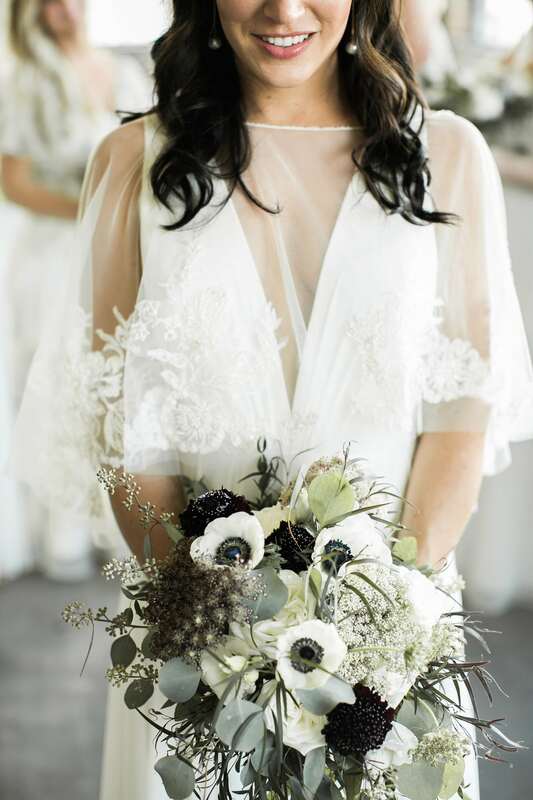 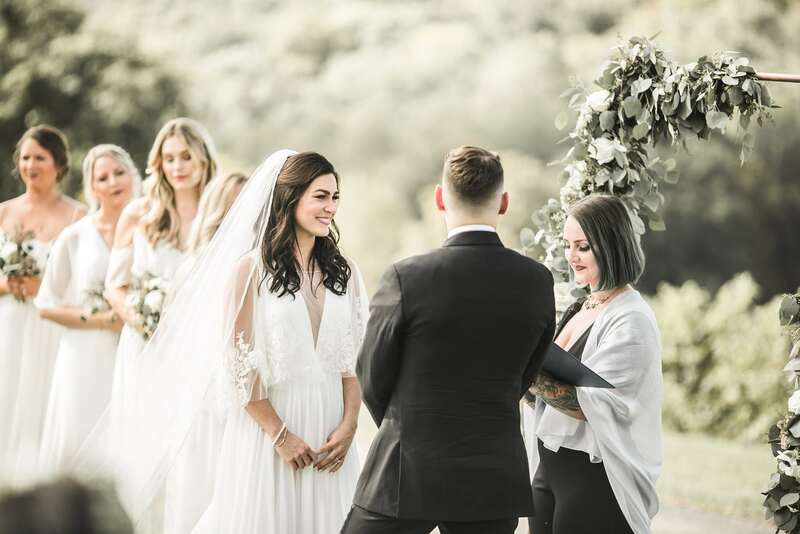 Chelsea’s dress and lace cape, the bridesmaids floral, flowing delicate dresses, and the sharply dressed groomsmen were also highlights. 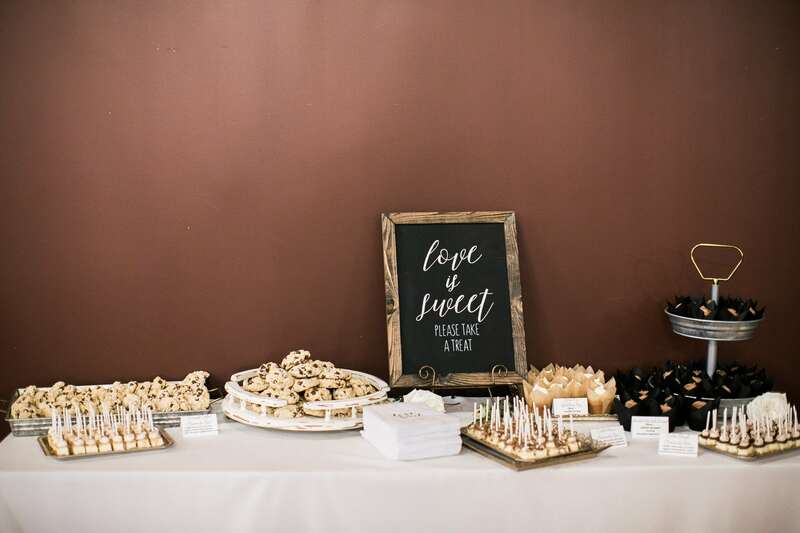 Accented by personal touches from the gorgeous hand-made stationary by Chelsea’s friend Gina, to the dessert bar, where guests enjoyed the groom’s grandmothers’ own cookie recipe, made by family members, there was no doubt this evening succeeded in incorporating friendship, family and tradition. 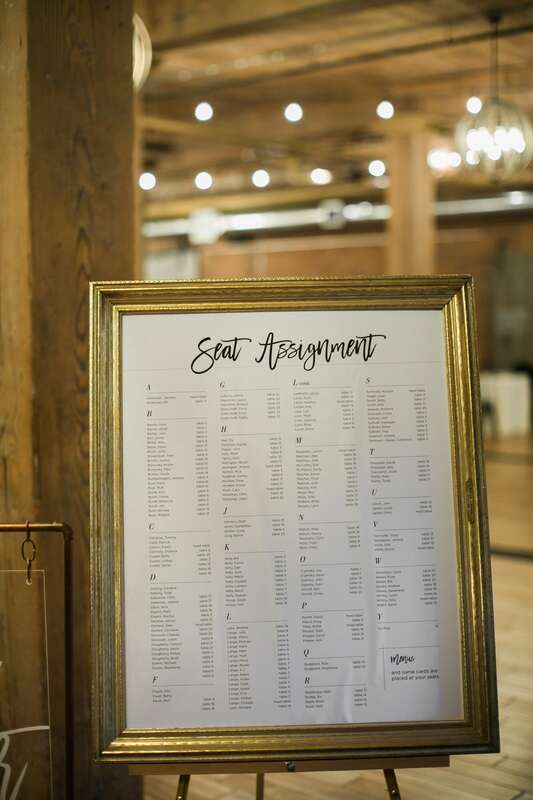 We want to thank the amazing vendors, without whom we could not have pulled off this amazing event. 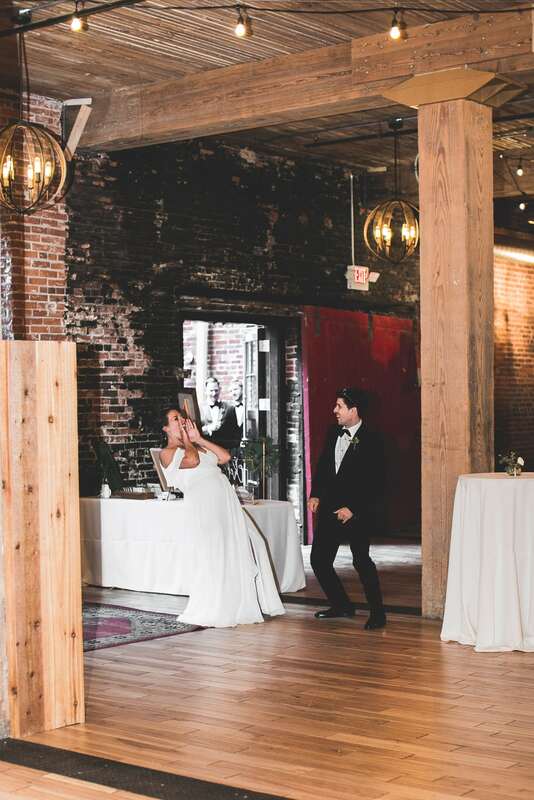 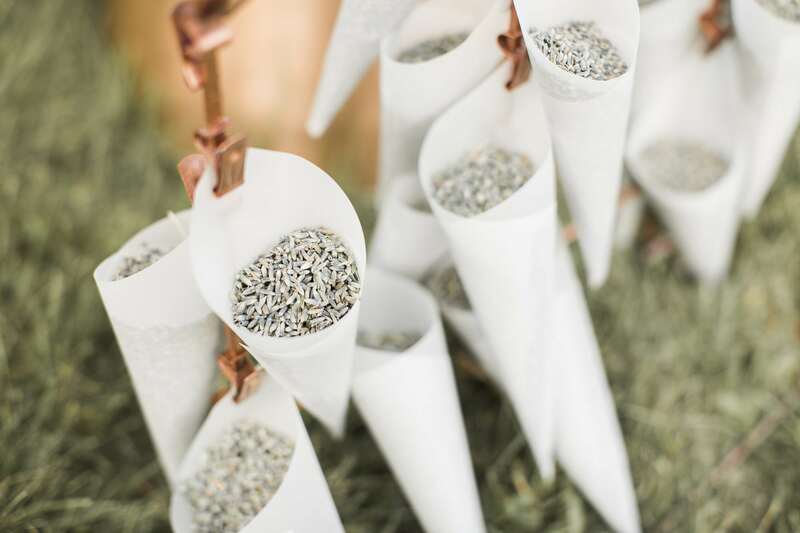 A special thank you to Unique Events, who we partner with often, for providing an awesome DJ, the event & floral design, and even a ‘confetti cannon’ which went off without a hitch during the dance. 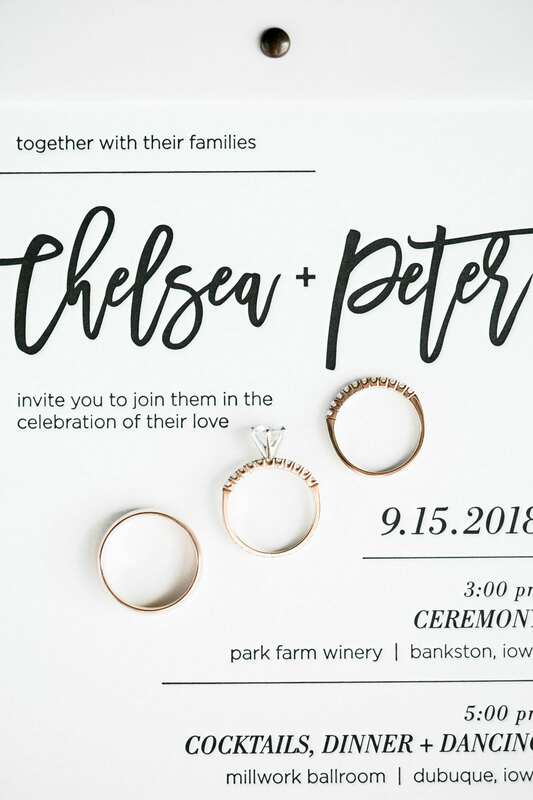 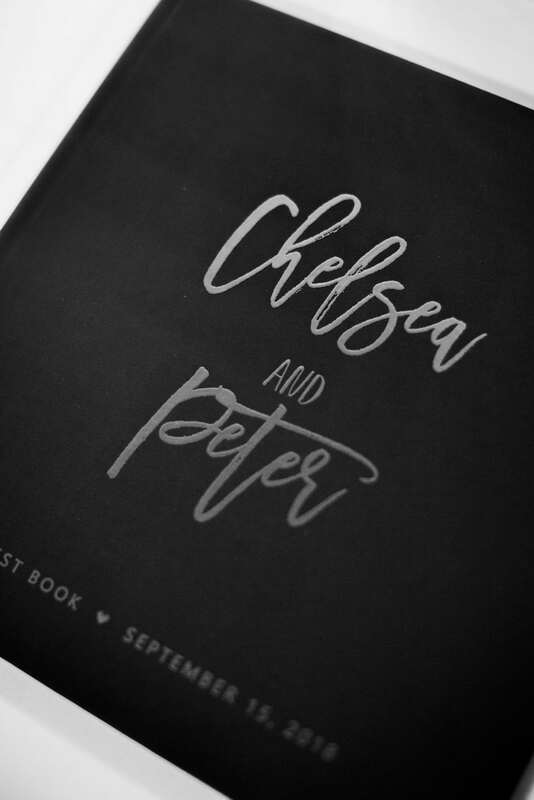 Congratulations, Chelsea & Peter!